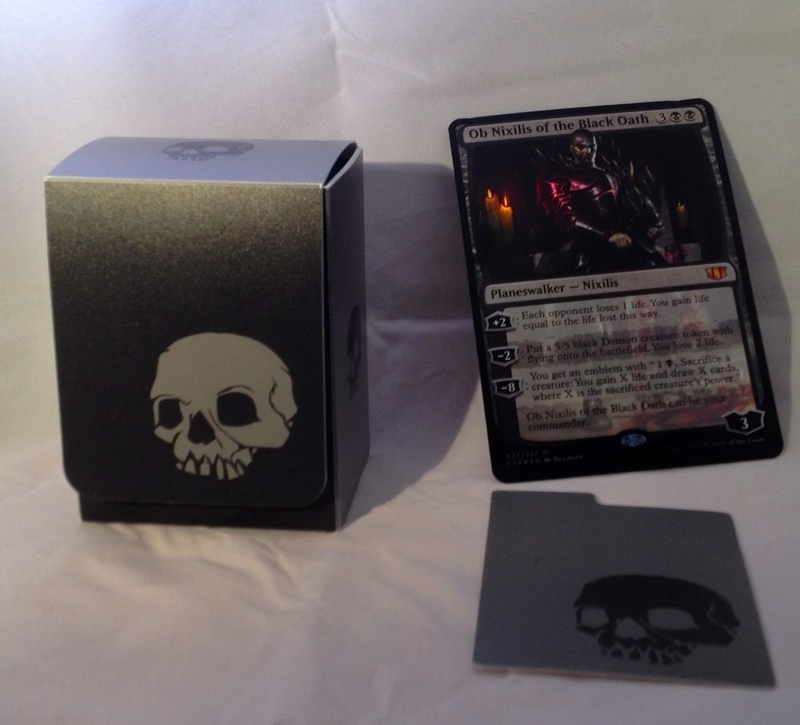 SpartanNerd Review Update…Customized Ultra-Pro Pro-Tower Deck Box! 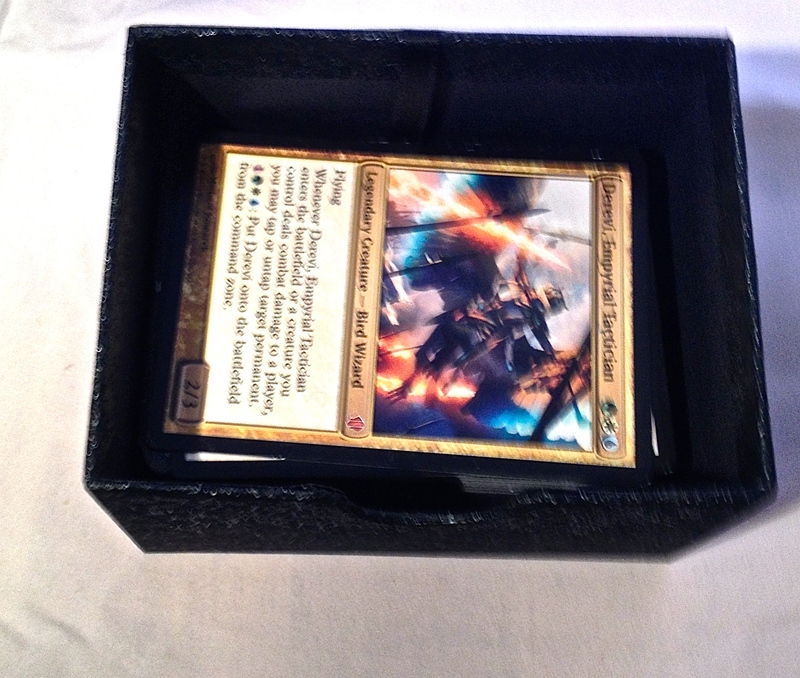 Faithful readers, go back and read my review of the Ultra-Pro Pro-Tower Deck Box, first, and then read this article to be more informed about what product I am talking about! So, I actually DID get the SpartanWife to do some work on the box for me! 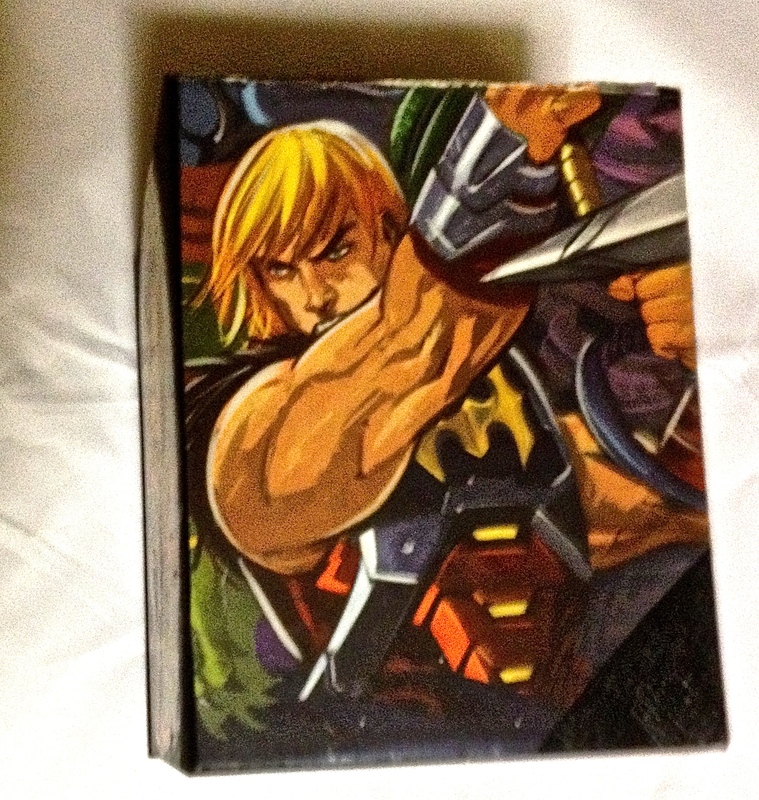 I chose art from some comics I had doubles of, “He-Man and the Masters of the Universe #8 and #9,” cut it out, and she decoupaged the art to the box. See my results below! 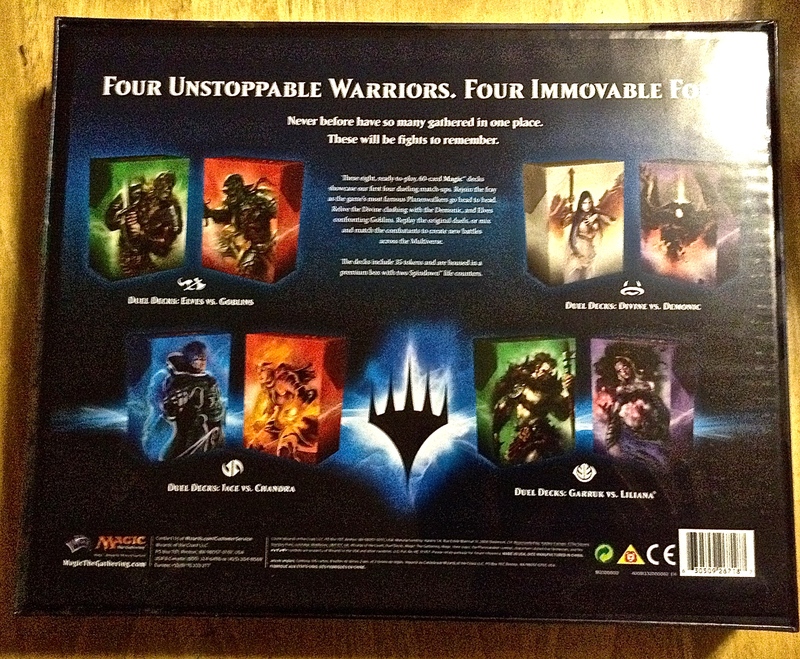 This is the back of the box. 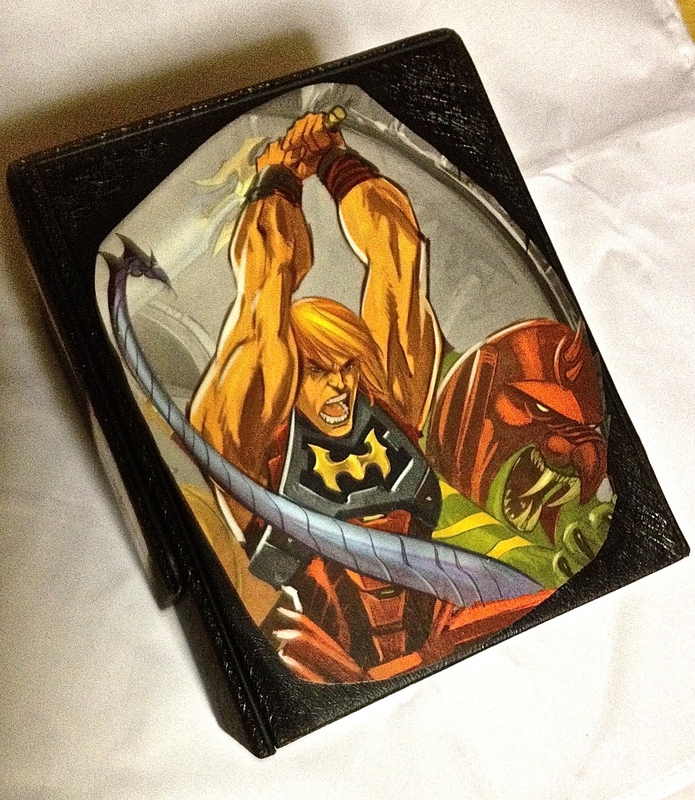 I chose a splash page, so that I might have a large image of He-Man holding his sword. When you open the box, you get to see the full image! This large image is SOOO IMPRESSIVE! I chose smaller art for the two sides. And instead of comic art, I chose the paper branding from a MOTUC figure that I hung onto for some occasion someday, such as this! When the box is closed and you are looking at it, there is no mistake what brand of entertainment I am into! As far as ease of project…I cut out the art that I wanted, and then she trimmed it up. The splash page cut the sword into two, but she was able to work it so that it appears seamless. She decoupaged with “Mod-Podge,” and it feels really natural, like it was branded there at the factory! 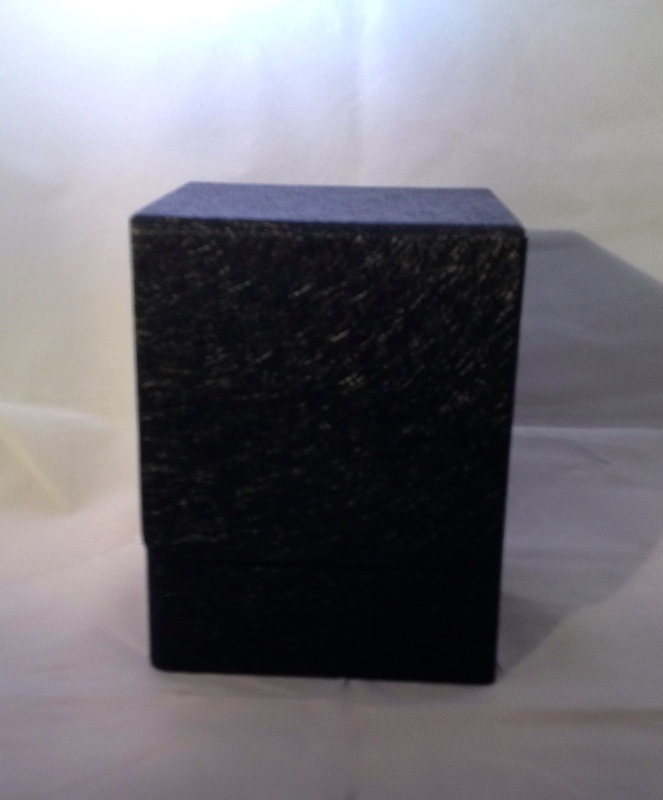 The intricate texture of the box didn’t hamper the process at all, as some people seemed to be afraid of when I mentioned this project to them. 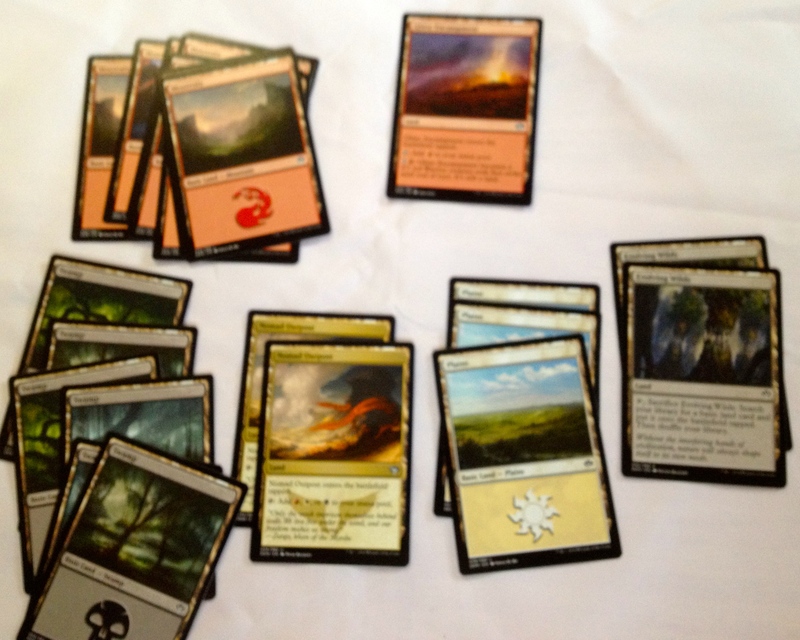 And as far as the results I got at the Magic tournament on Saturday, many people said WOW when they saw it! A few people wanted to touch it, which was cool…It was dry and all. 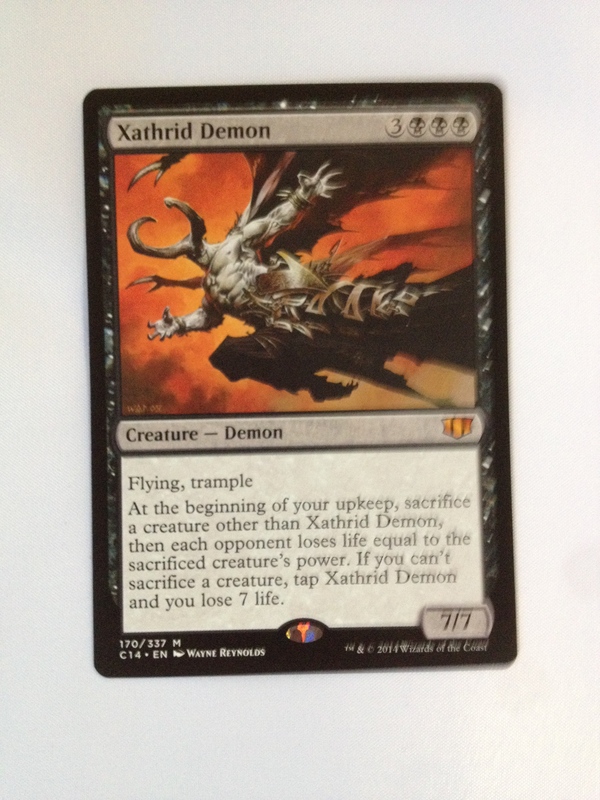 And I had double the EDH matches, so it worked for getting attention as well! The SpartanNerd give the SpartanWife a full 5/5 on this project! Please leave comments and let me know what you think. She would also like to hear from you, oh Hub City Geeks! Looks like I have a new problem. See my conundrum? 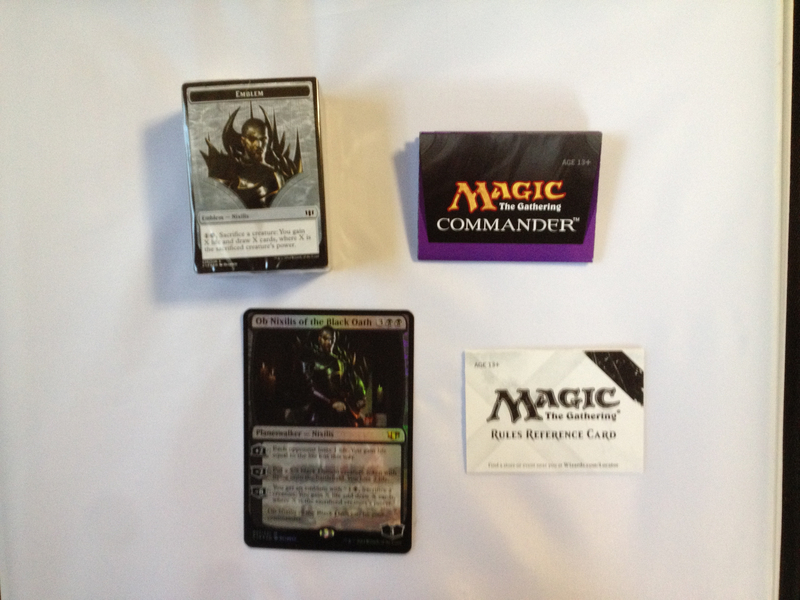 When sleeved, (I am using Dragon Shields), the cards do not fit in the box properly. 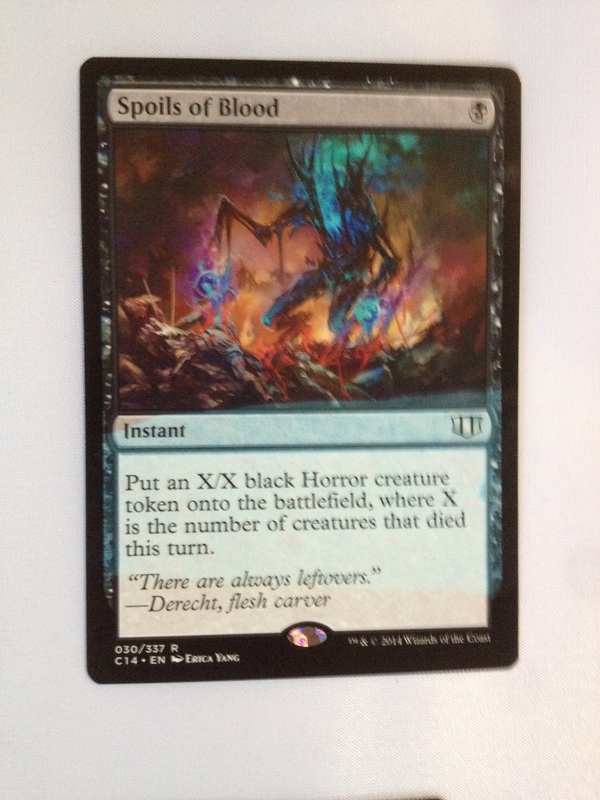 Much less can you put that oversized planeswalker card in there! Bummer! 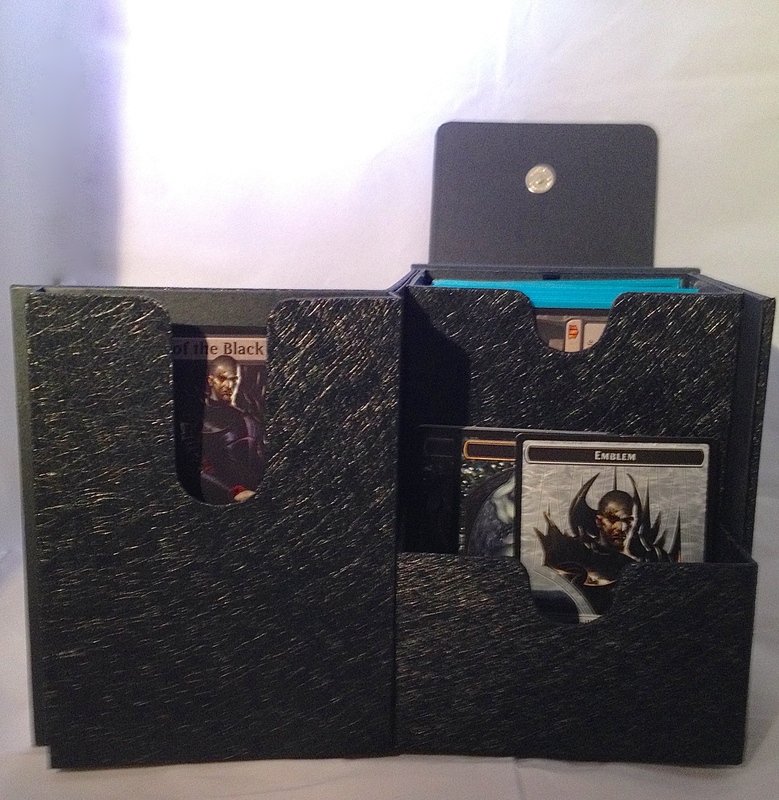 This deck box with top down design can hold 100 sleeved cards. But that’s it. Oversized Ob Nixilis has to sit out. Also the divider. AND you’ll have to bring another container for dice and tokens. There is now a solution! 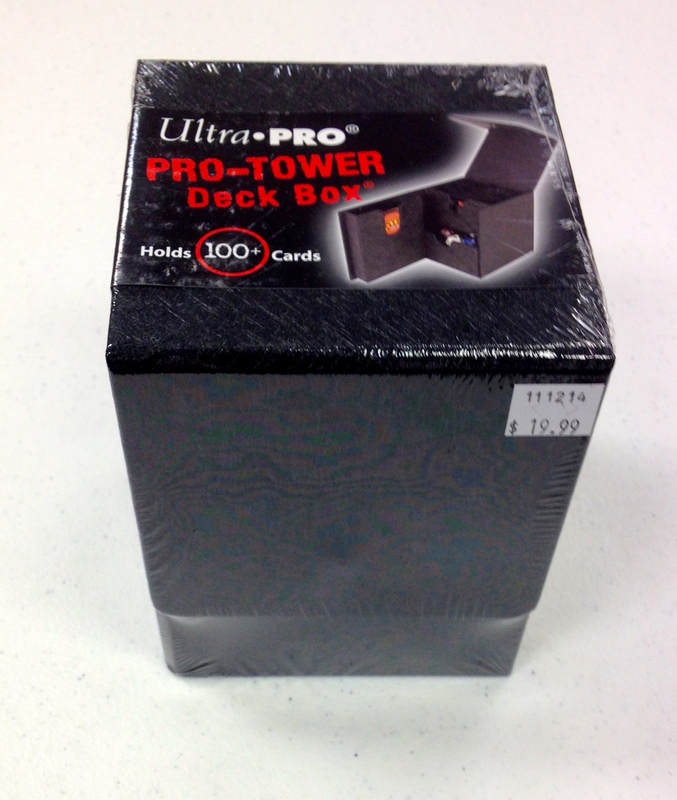 The Ultra Pro Pro Tower Deck Box! Here is a picture of it on the playing table at The Tangled Web, before I opened it. Notice the price…$19.99. 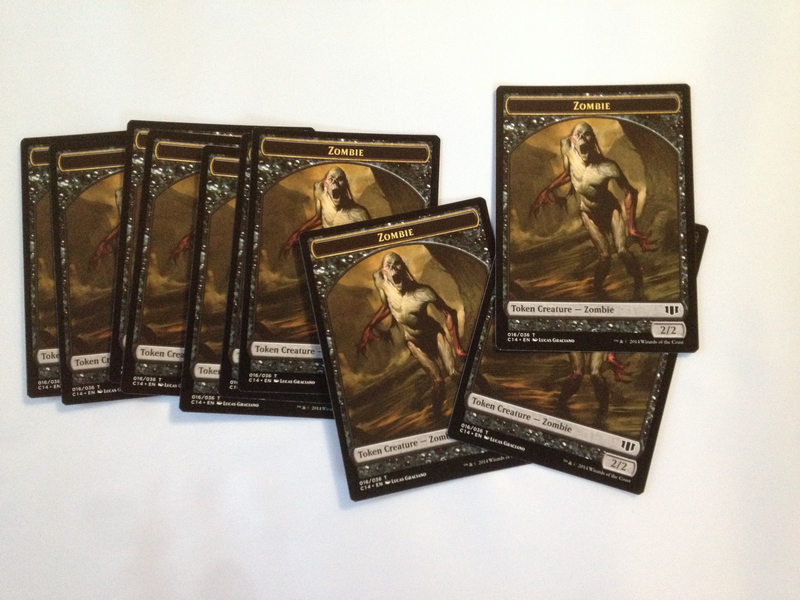 There is a more expensive version that comes with sleeves and has art on it. 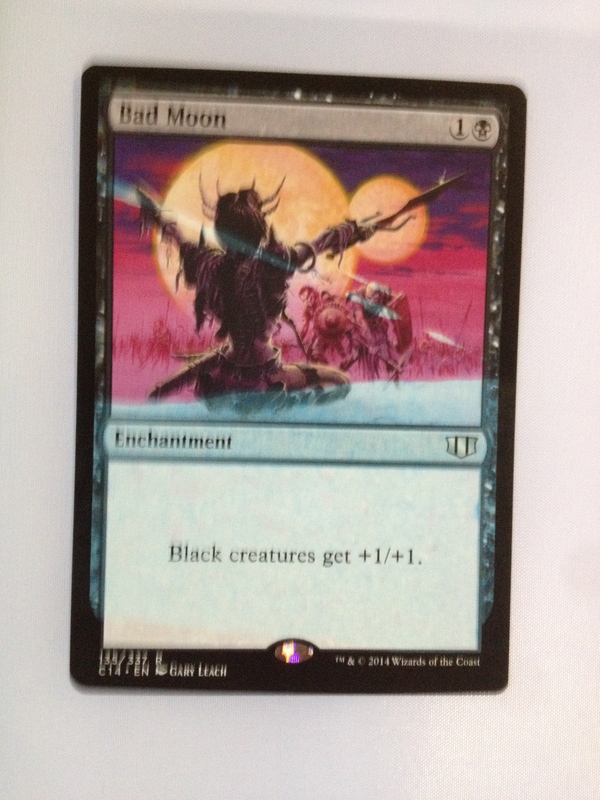 I didn’t care for the art, so I went for the cheaper black version. I don’t know if other colors of this box exist. Cellophane removed, the deck box has a rough finish. It is rather nice, actually. The texture captures the light different ways when viewed from different angles. Not sure if that can come through on the photo. The box seals from the top via a magnet that is surprisingly effective. It is easy to open the box, though. I’m sure dropping the box with cards in it might cause the magnet to let go. (But that probably won’t happen, right?) Other things about the appearance of the box; the words “Ultra Pro” are tattooed on both sides. and it is pretty clear where the flap is looking at it in normal light. What makes this a great box is all that it has to offer! 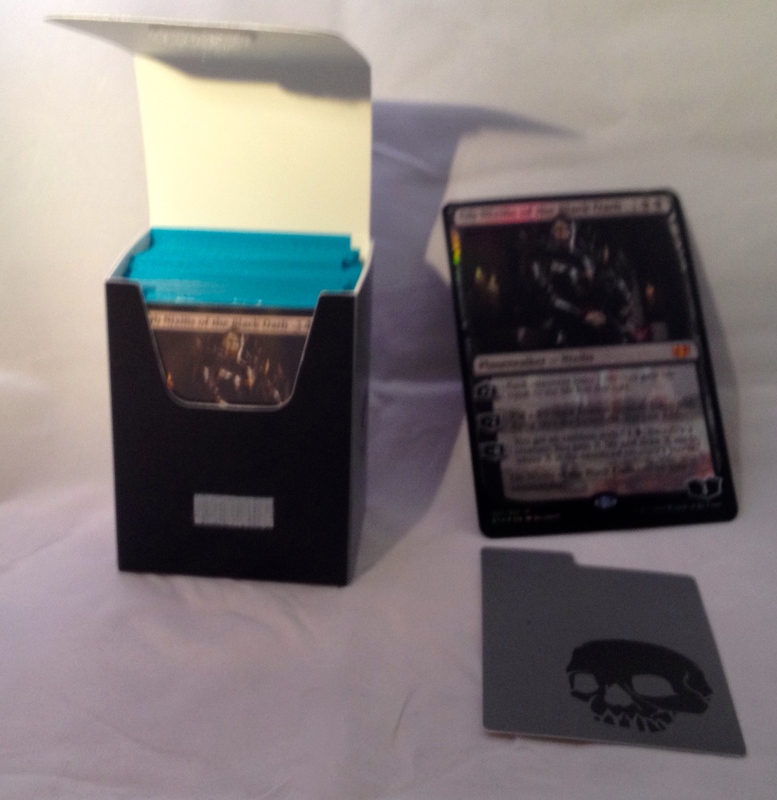 Opening the box from the top reveals a compartment where you can store a deck. 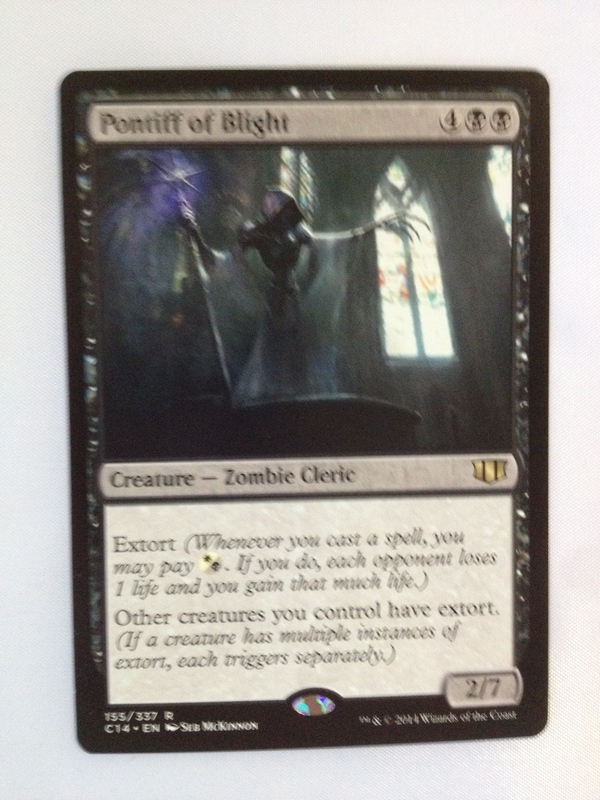 Then there is a door that swings out, revealing a place to store your oversized cards! 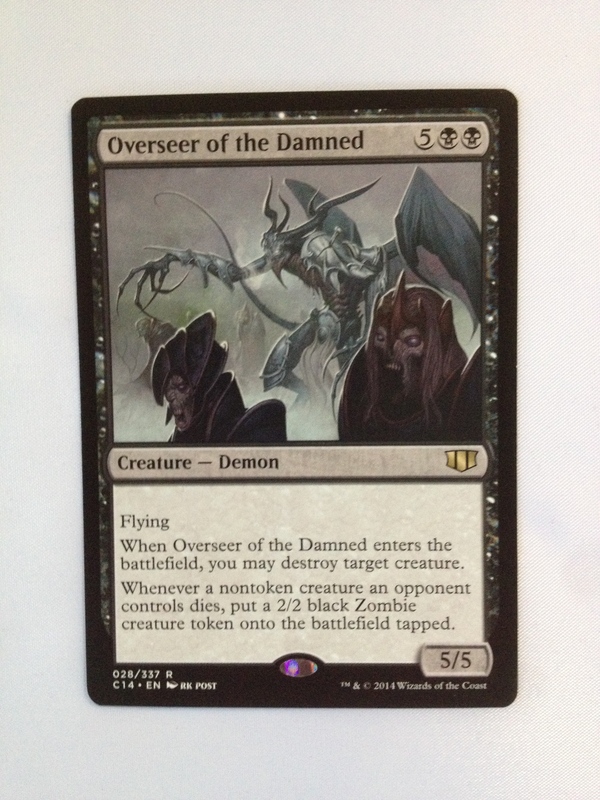 Perfect for those big planeswalker and legendary Commander cards, and one of the only solutions for that problem I have seen! With this door open, you can see another compartment below the top compartment. This pulls out jewelry box style. This piece is slightly smaller than the top compartment though. I believe the intention was to store dice and tokens here. 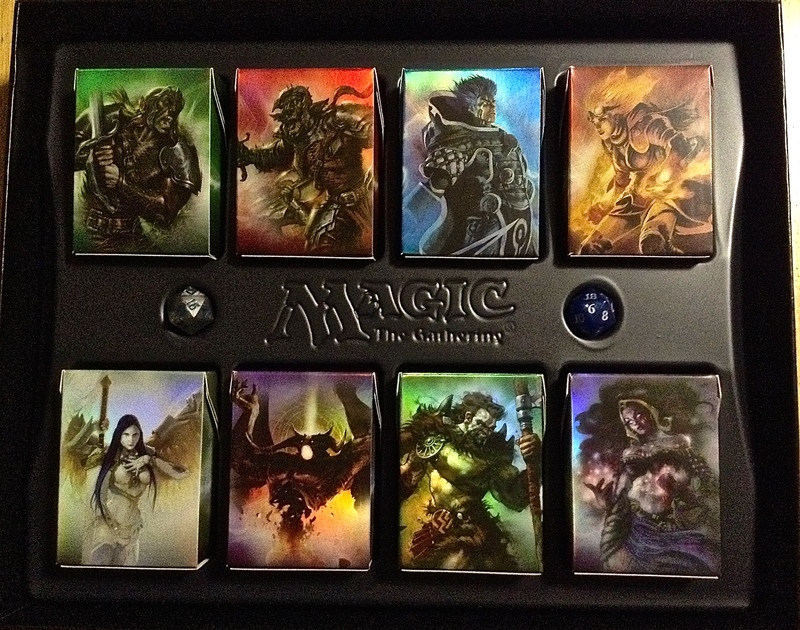 Also notable…both compartments have a ribbon that makes it easier to grab hold of the cards if you can’t grasp them for some reason. Here is a pic of it loaded. I stood the tokens up only for display here. 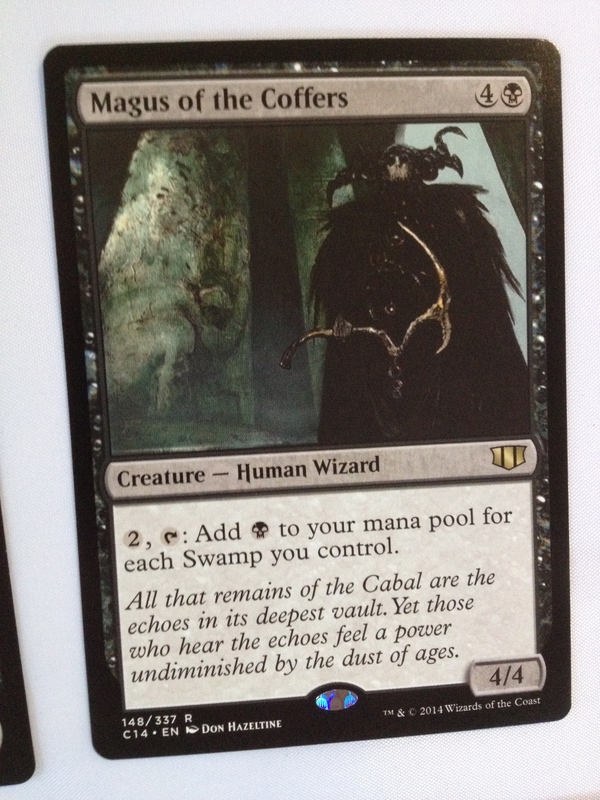 You can see Ob Nixilis’ big card staring at you through the access hole in the door. 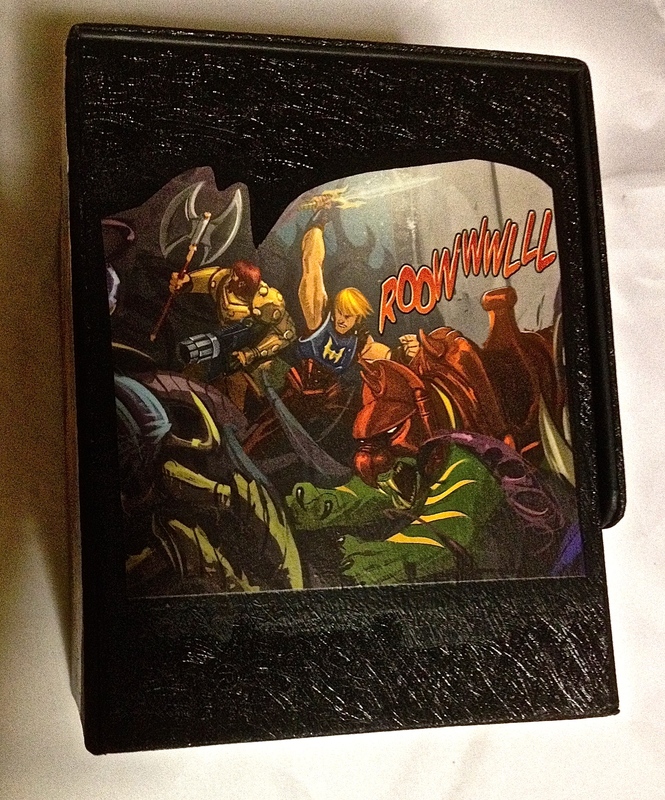 You can see his small card in the access hole in the top compartment. 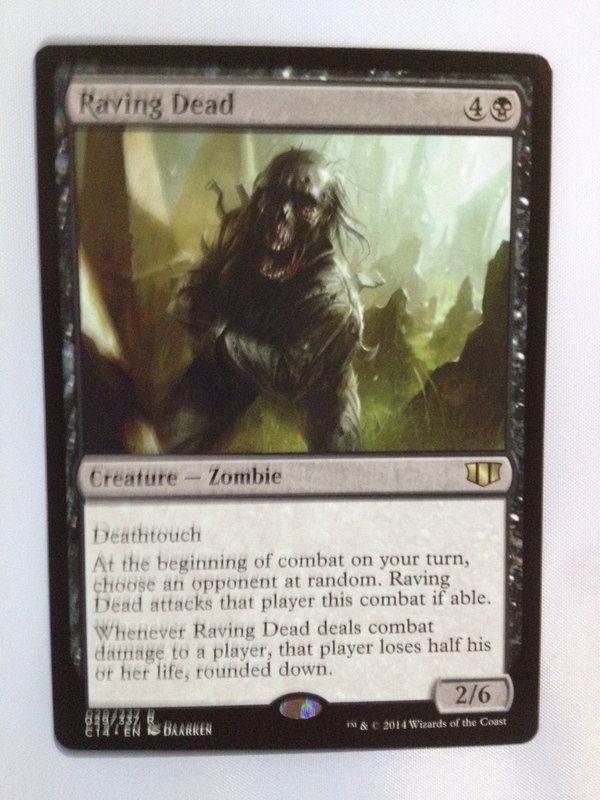 This is a great home for the Sworn to Darkness Deck! 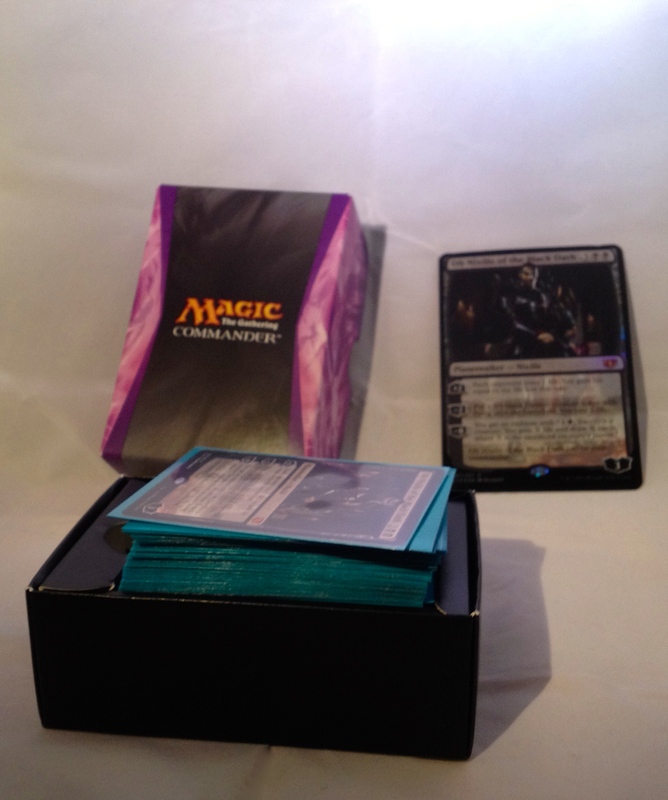 Finally, I would point out that the bottom drawer can be removed..(I said it was jewelry box style)…and you can actually fit another sleeved commander deck here, if you load it flat rather than side loading. Great for carrying two decks around with you! Maybe you want to play with a friend and they forgot their deck. 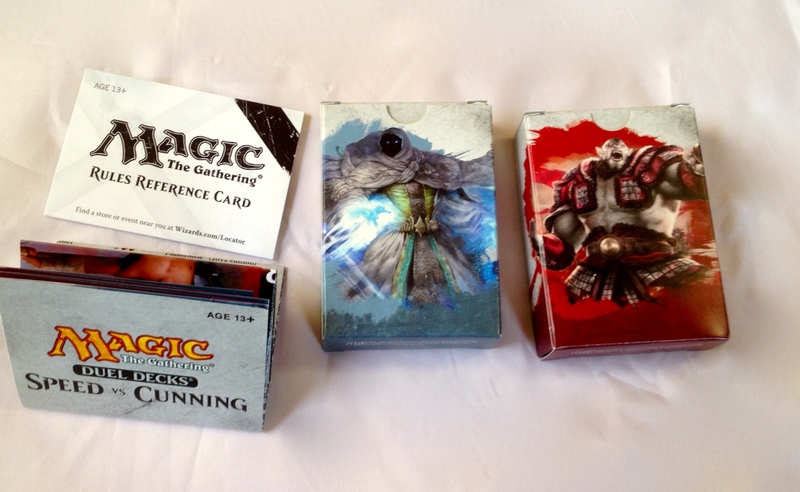 If you lugged the Ultra-Pro Pro-Tower Deck Box with you with two decks, then you can still have a fun game! 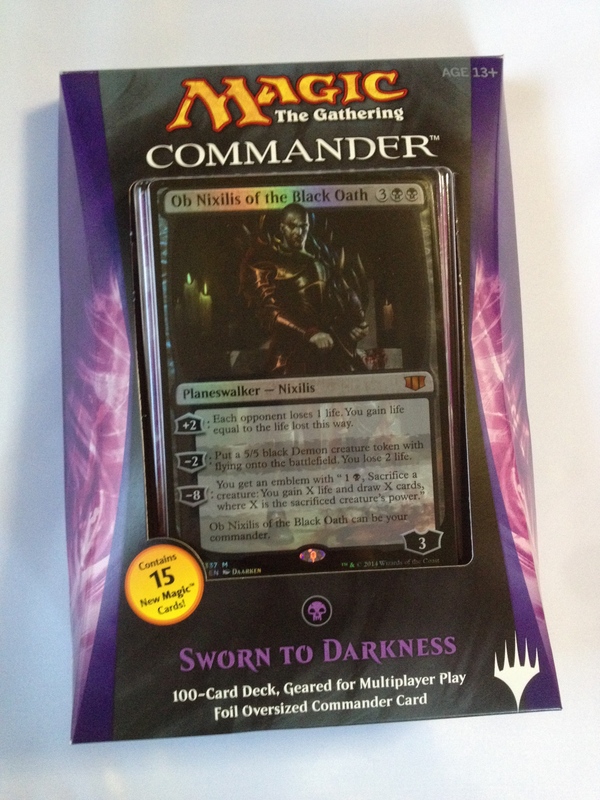 I have all five 2013 Commander sets, and Sworn to Darkness from this year. 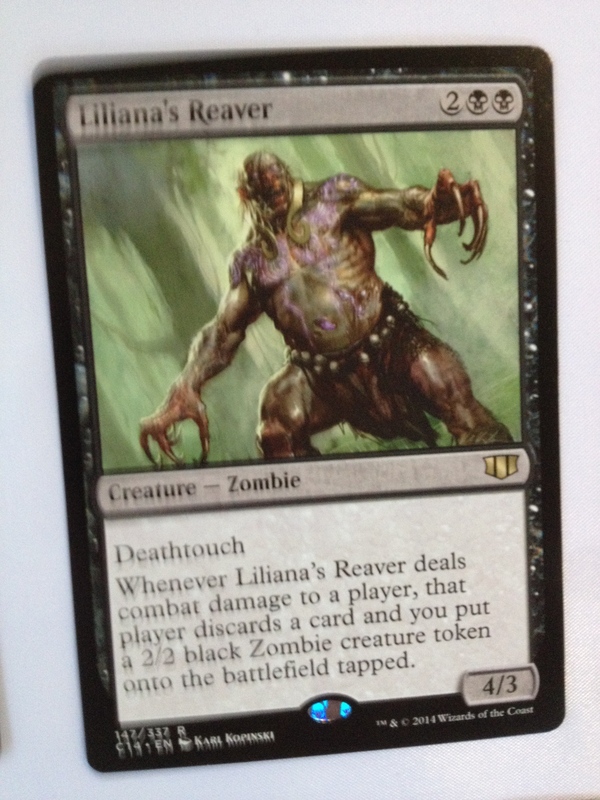 If you’ll recall, last year’s decks came with three oversized legendary cards. 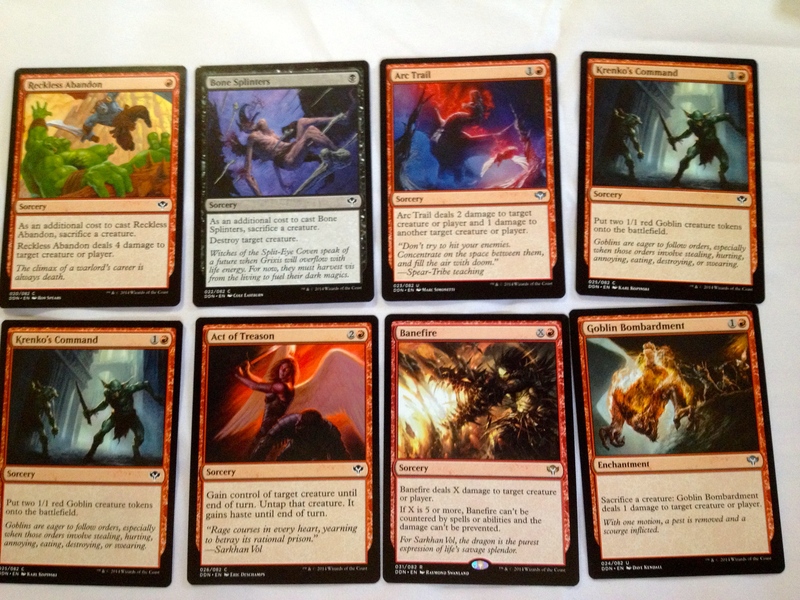 All 15 of those fit in the drawer, as well as Ob Nixilis and Garruk, The Slayer. It is safe to say that is AWESOME! I love the multi-purpose compartment on the bottom! I love that the top compartment allows side loading easily! I love the handy ribbons that assist in getting the cards out easily. Not much really. I suppose the bottom compartment could be the same size as the top, allowing a second side-loaded deck. But like I said, I’m not sure it was the full intention that that bottom compartment be for a second deck. Sill, you can’t side load the bottom up with token cards either. It is great for all of those dice though. The other thing is more personal. 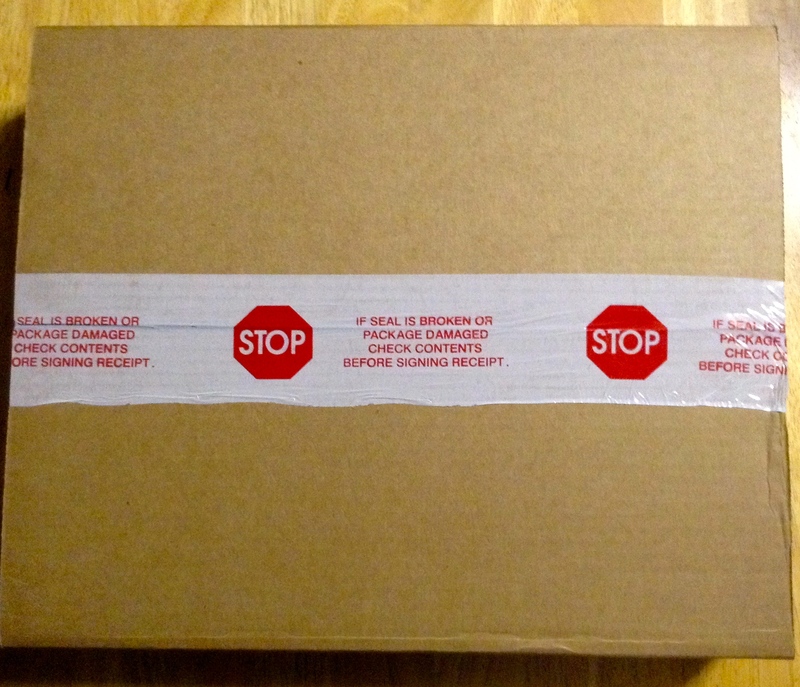 The SpartanWife is quite crafty…I believe she can really personalize this box for me. The black color and interesting texture are great. 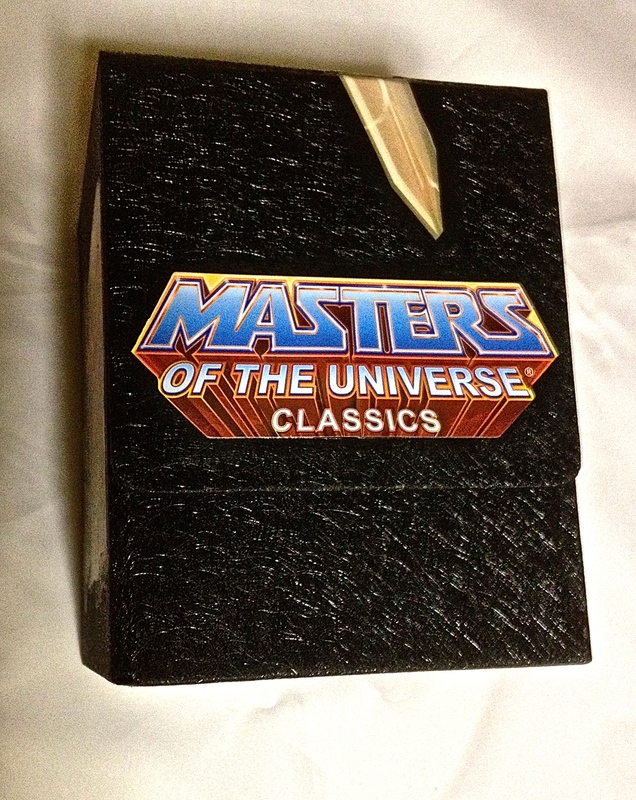 But if she could get some Masters of the Universe artwork on there, then this would be truly the ultimate deck box experience! What do I rate the Ultra Pro Pro-Tower Deck Box? I can’t see any reason to mark points off of this product. While it might have a little room for improvement, I am really having to nit-pick at it just to point that stuff out. 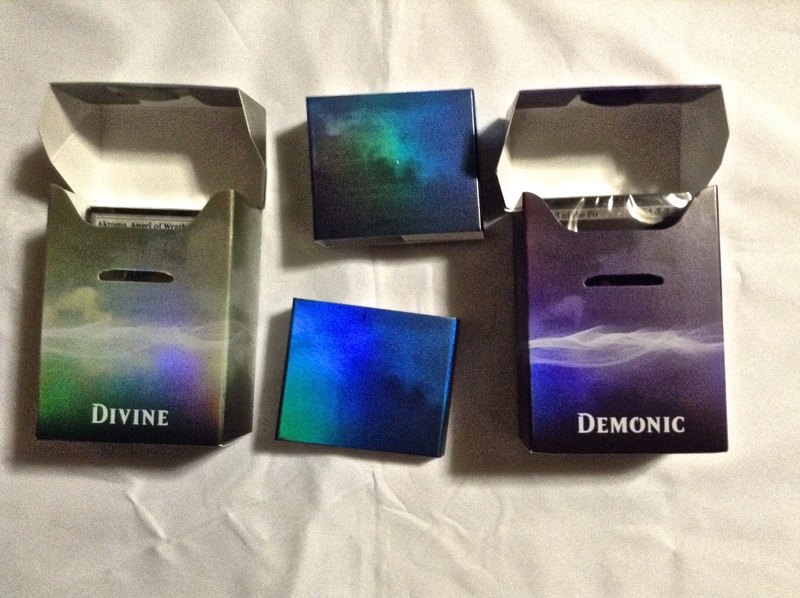 It is a marvelous box, and every player should get one. Maybe even two or three! 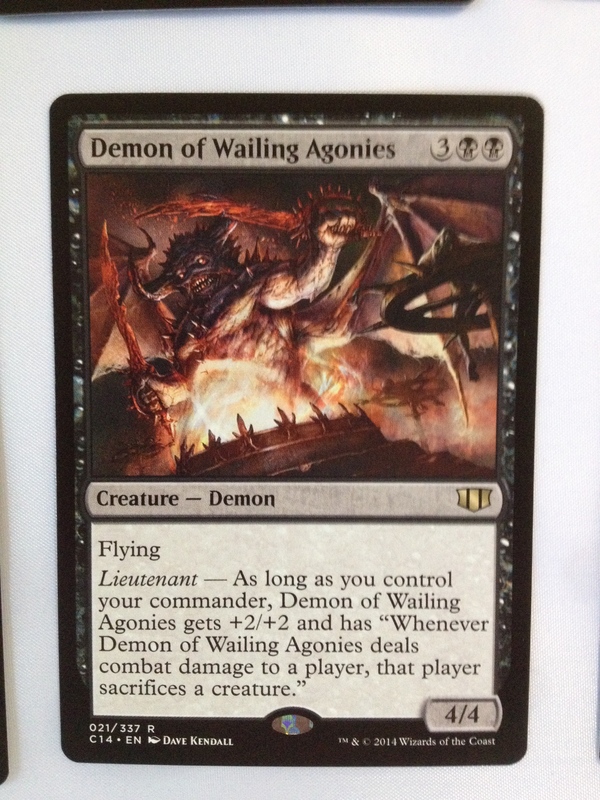 And since it is Christmas soon, this is a great present for a MTG player from a non-player who might not know what to get. 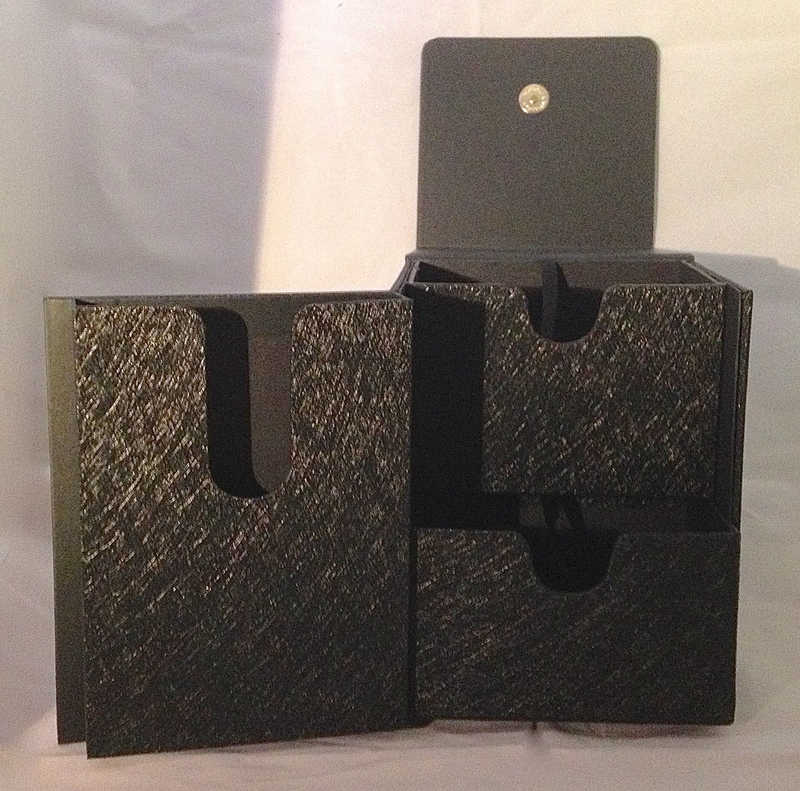 The box has a dedicated space for oversized cards, two storage compartments, is easy to carry, has a reasonably strong magnetic latch, and is quite affordable in the plain black version! My rating is 5/5! Do you agree with the SpartanNerd? Let me know in the comments! 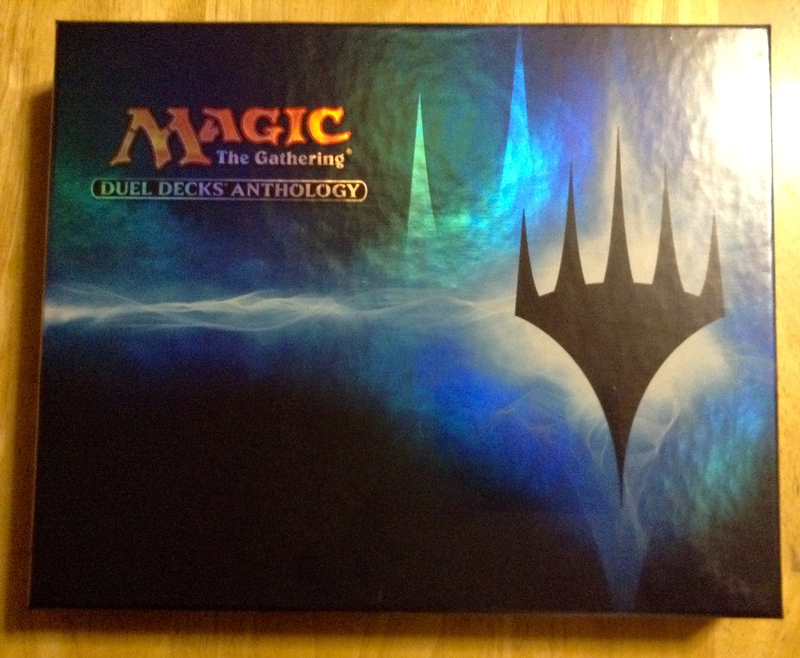 I rather enjoy the duel decks series of cards…I may just have to purchase that big box of four or five that is coming out soon, so I can see what the older ones were like before I started playing Magic. 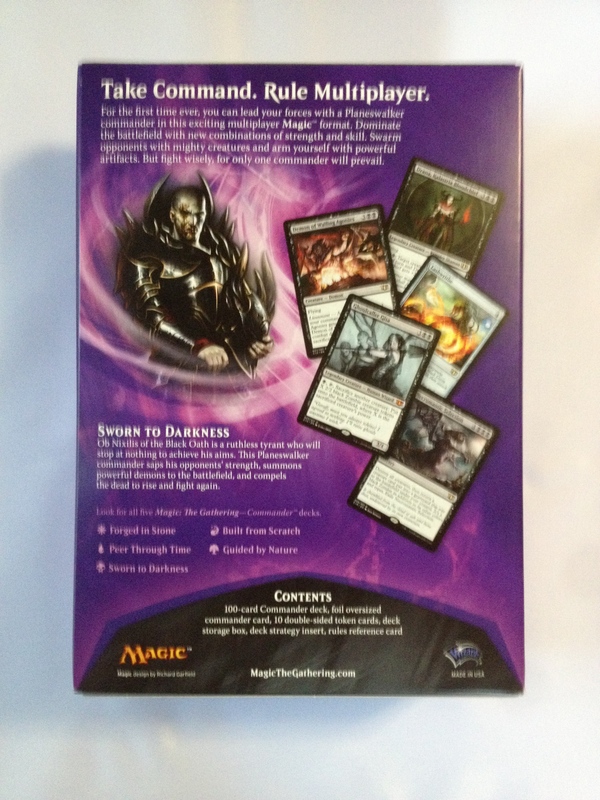 Here is the front and back of the packaging. 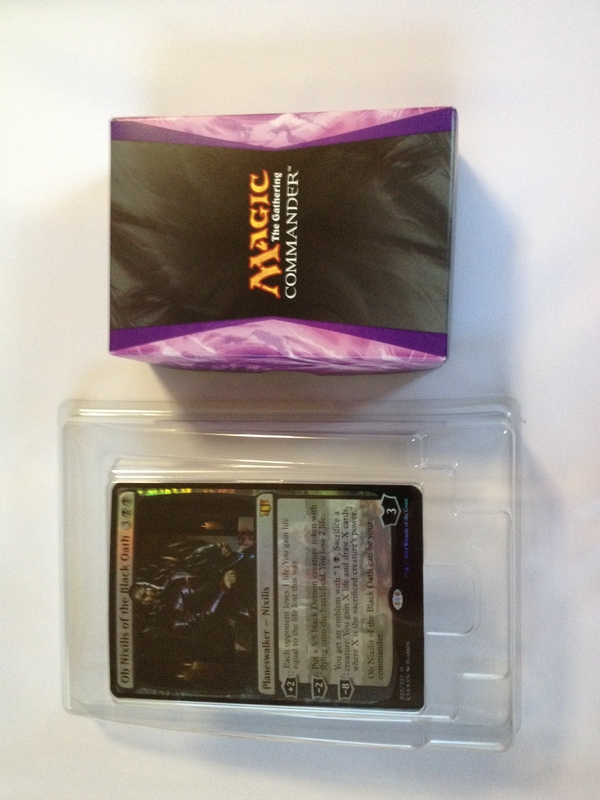 First thing I notices was that this packaging wasn’t quite as spectacular as the last Duel Deck offering, “Jace vs. Vraska.” But I guess this time we don’t get planeswalkers either. 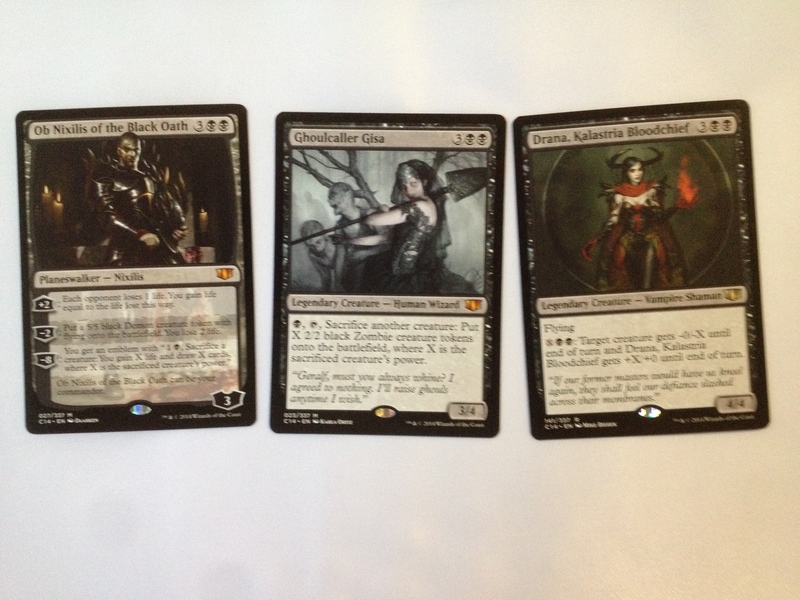 Here is what’s inside, besides the cards. 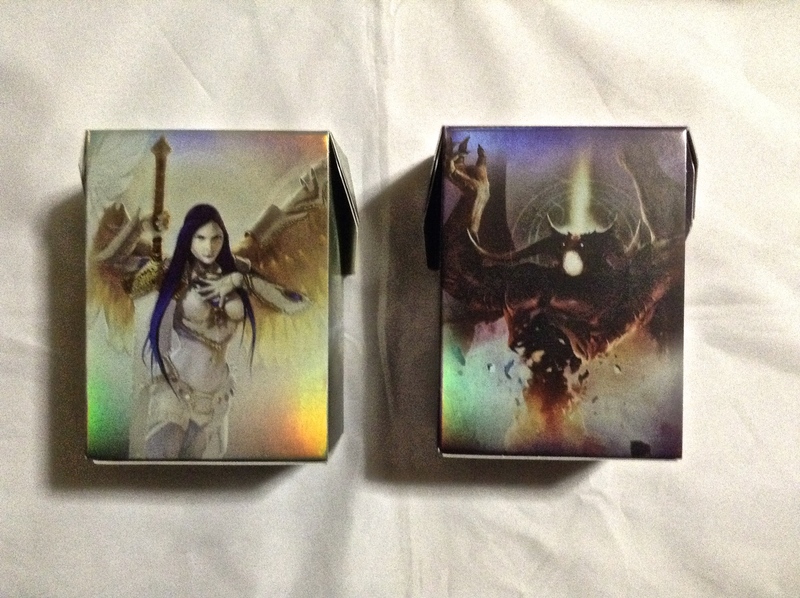 Two deck boxes, both featuring Arcanis the Omnipotent and Zurgo Helmsmasher respectively. There is a poster exclusively for this set….and what’s that? No extra useless poster? YES! They have improved that situation! 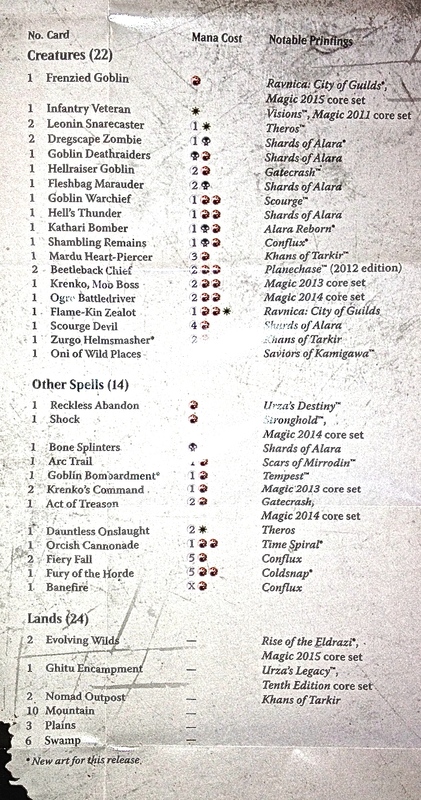 Now there is a quick reference rules card for new players. This is SO MUCH BETTER. Who knows how many of those blue posters that featured Chandra that I threw away. This might still find its way to the trash, but the Wizards are always talking about reaching and teaching new players. This is a step in the right direction. 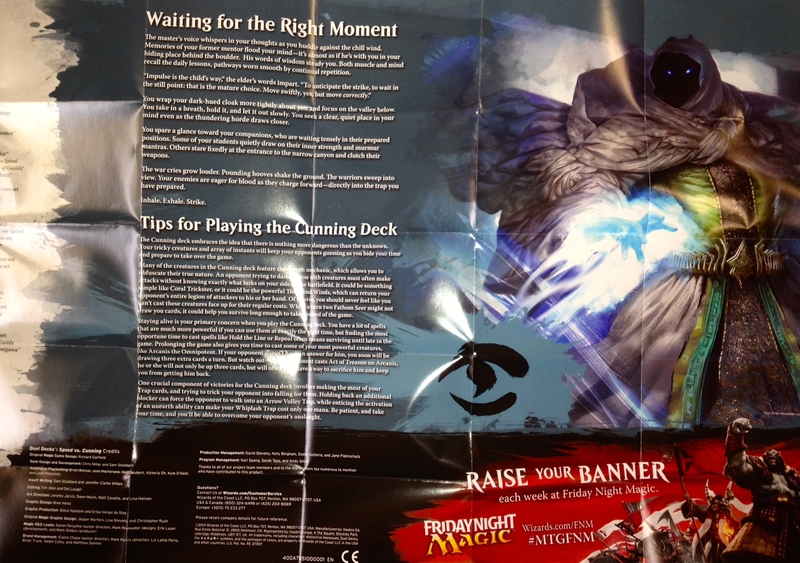 I am including a photo of the front and back of that rules card below. The two-sided poster inside didn’t disappoint. 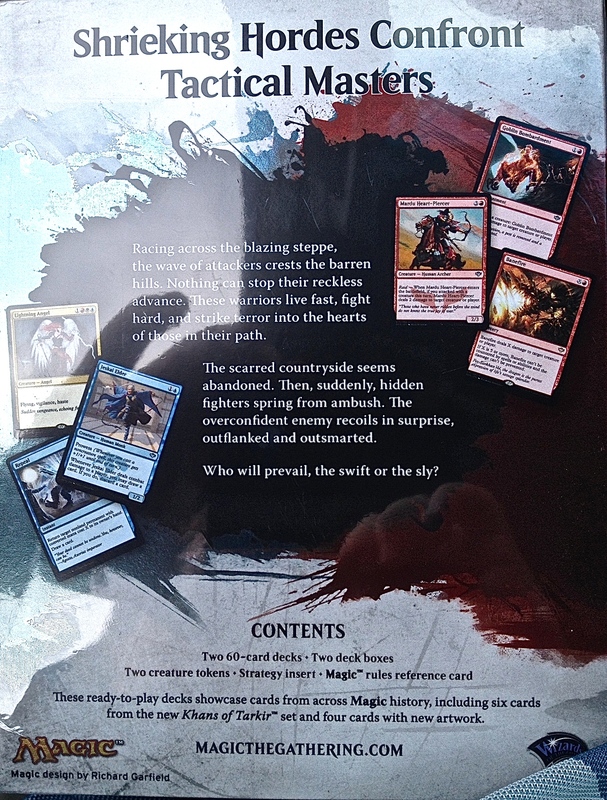 Here the art is good, and it gives you plenty of information about each deck. I like how the fantasy flavor is sprinkled in as well. 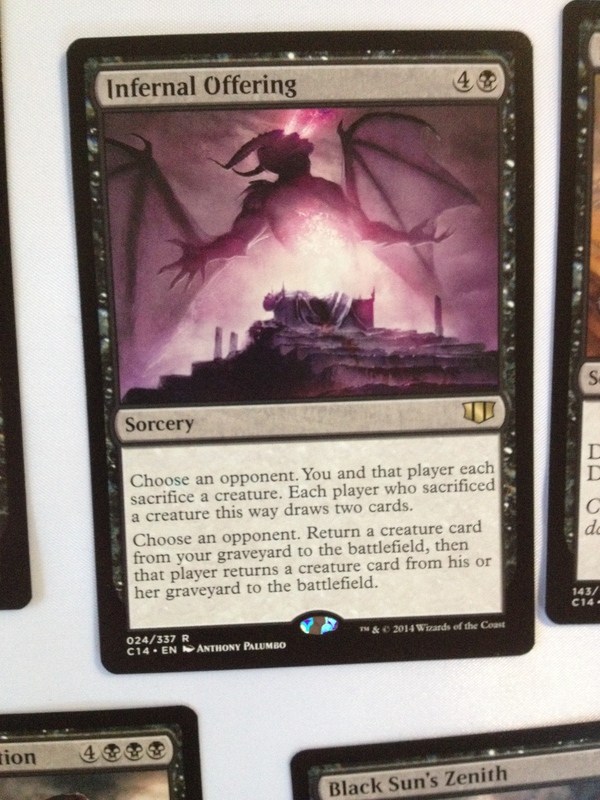 This Duel Deck is supposed to highlight the fight between the Mardu and the Jeskai. 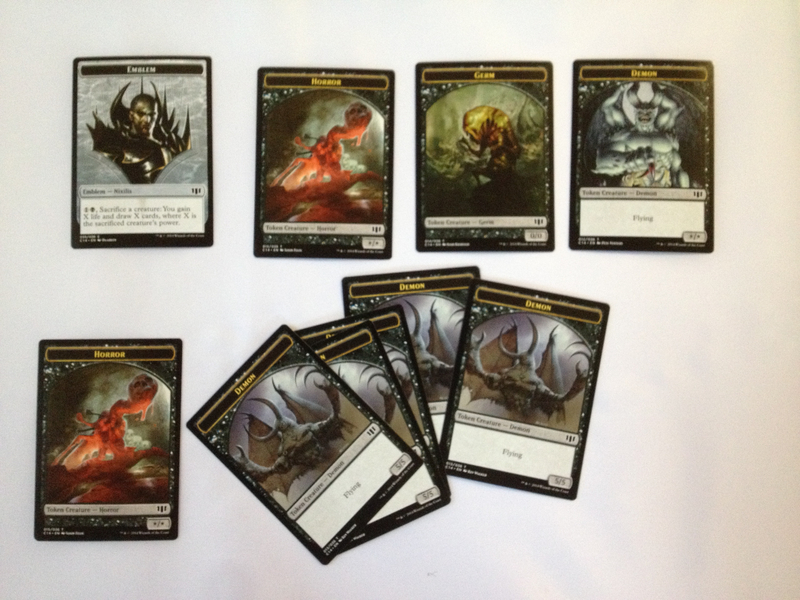 The next set, “Kahns of Tarkir” is supposed to feature three-color cards. 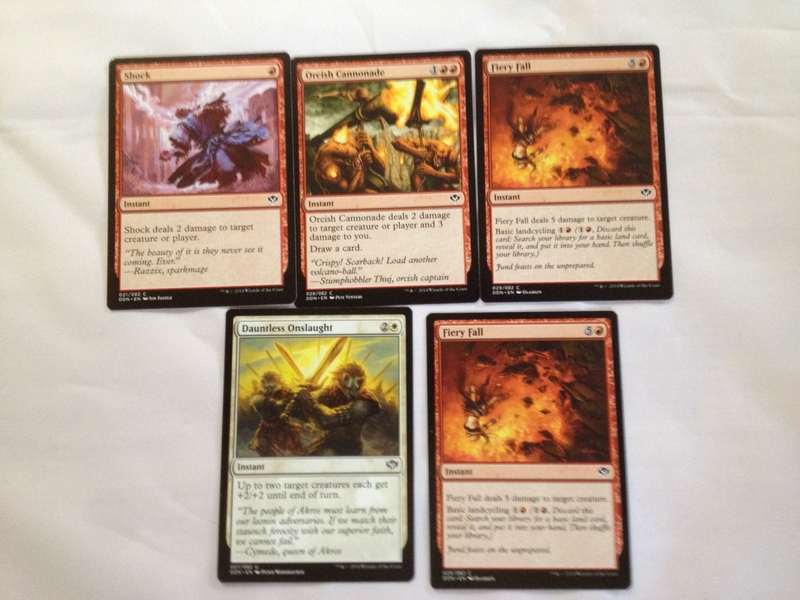 Mardu is Red White and Black. 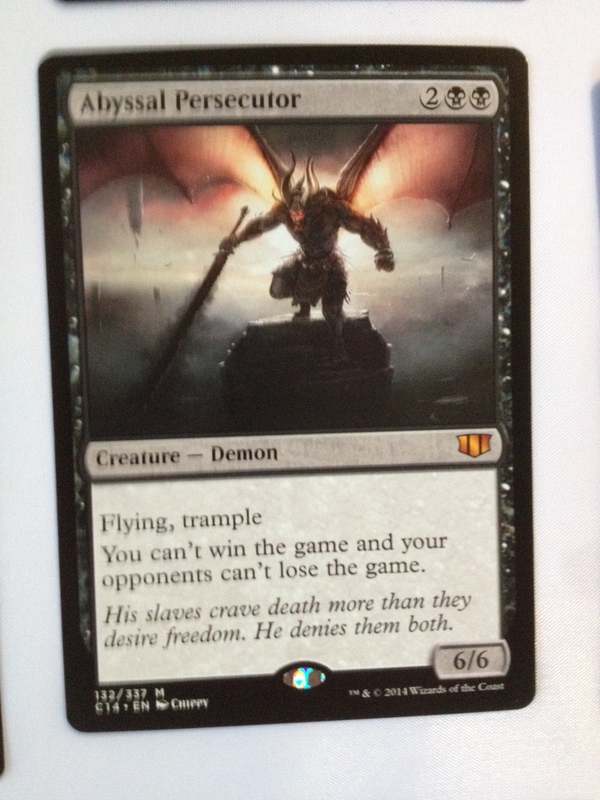 Jeskai is Red white and Blue. 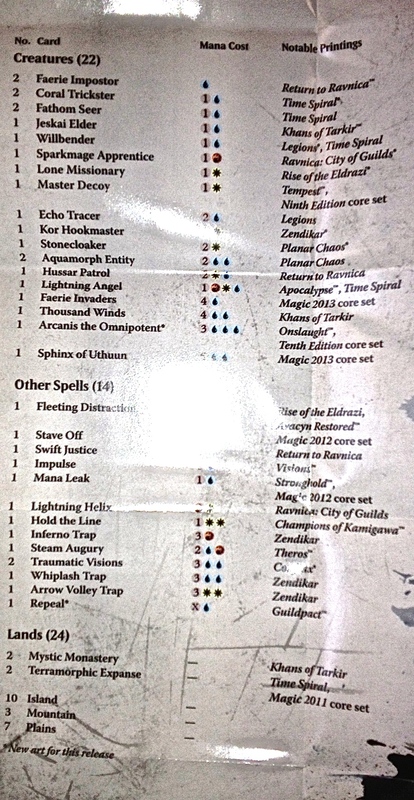 Below is the deck list. I thought it best to make this as large as I could, so you could read it. 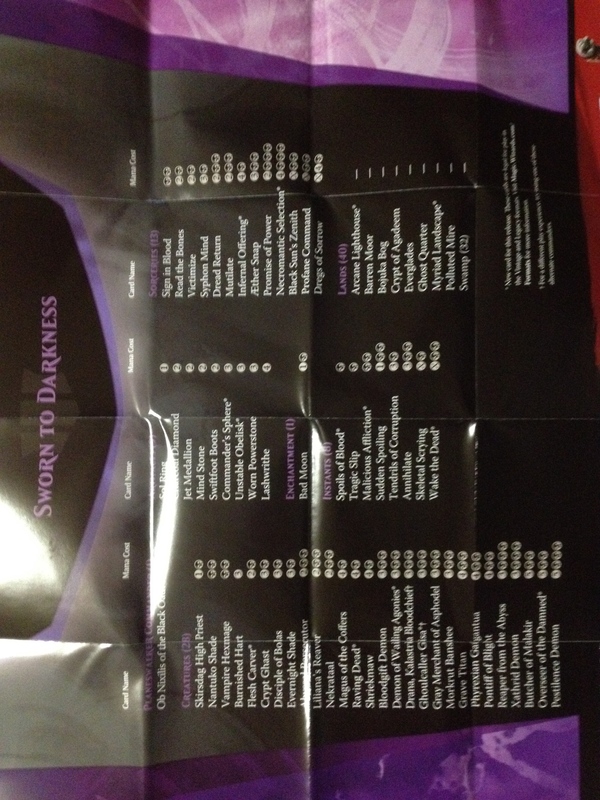 There is a list on both sides of the poster. 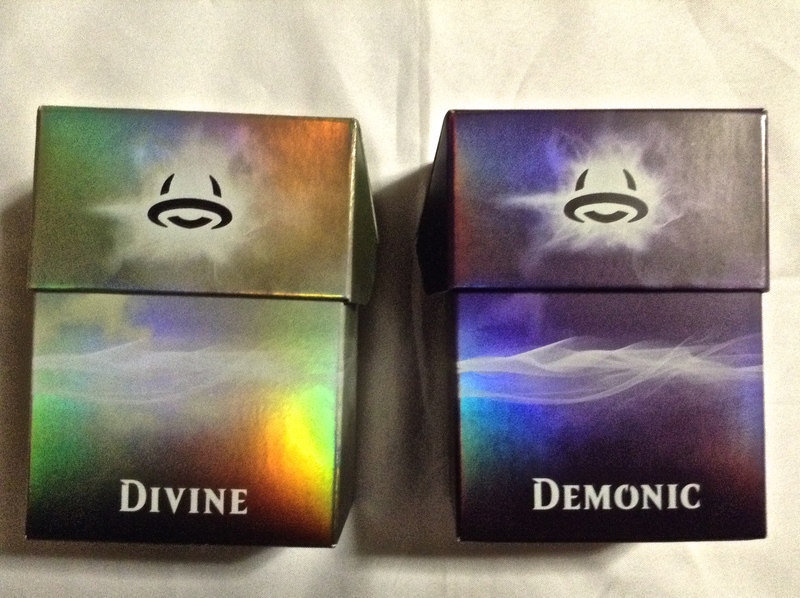 The first is the Arcanis the Omnipotent deck. 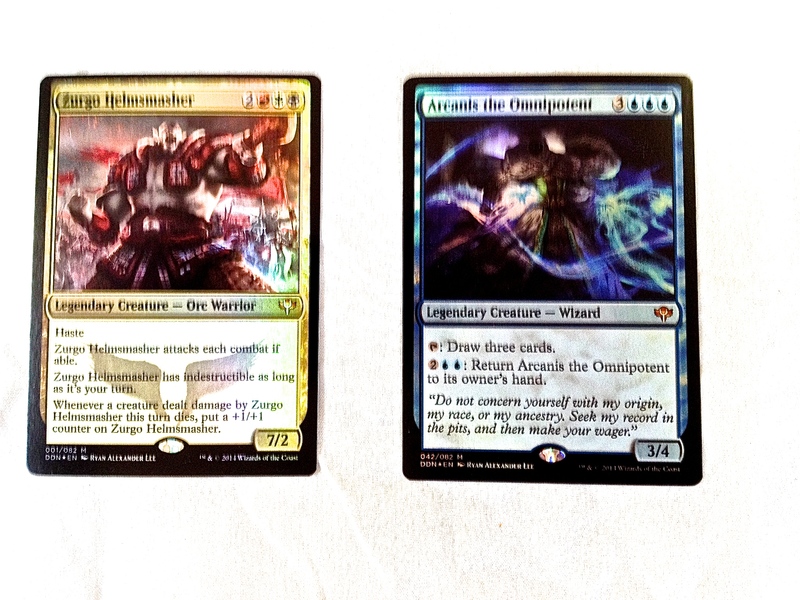 The second is the Zurgo Helmsmasher deck. Now it’s time to see some actual cards! 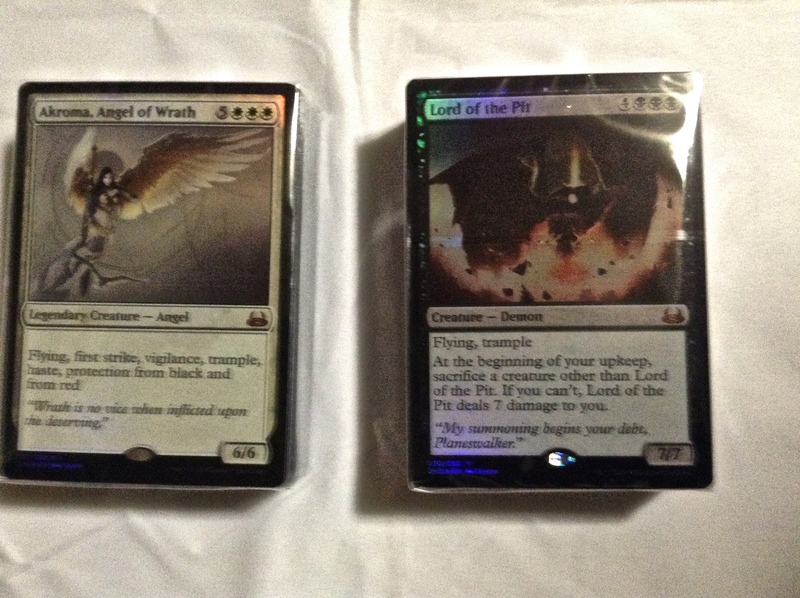 The two premium foils that come with this deck are really powerful cards. No question. 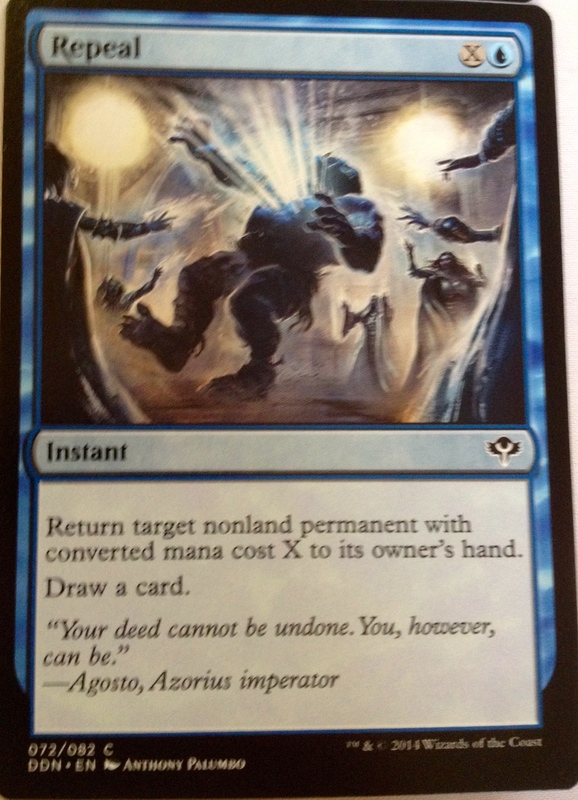 I think Arcanis is an odd choice to showcase because he is all blue, rather than a three color card, however. Here are my thoughts on each card. Zurgo Helmsmasher has haste and swings for 7. WOW. He is a 7/2, however. 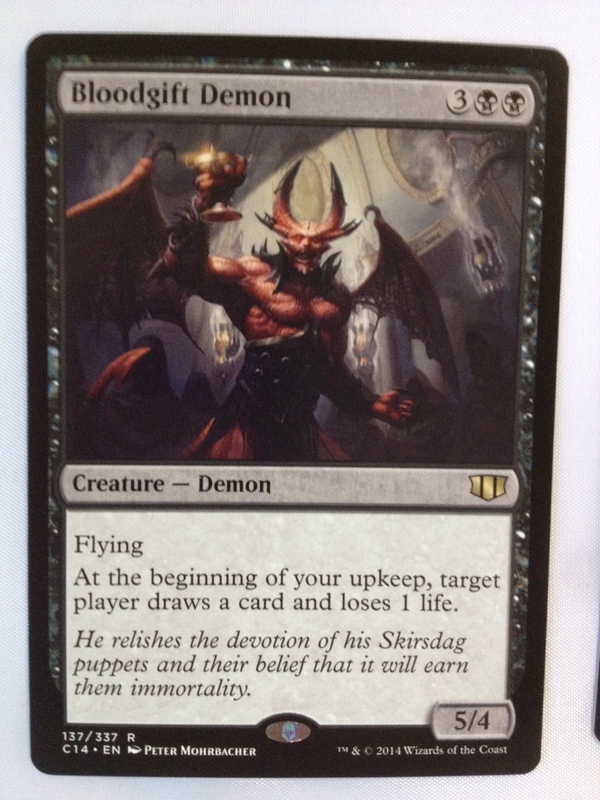 He is indestructible on your turn, though. 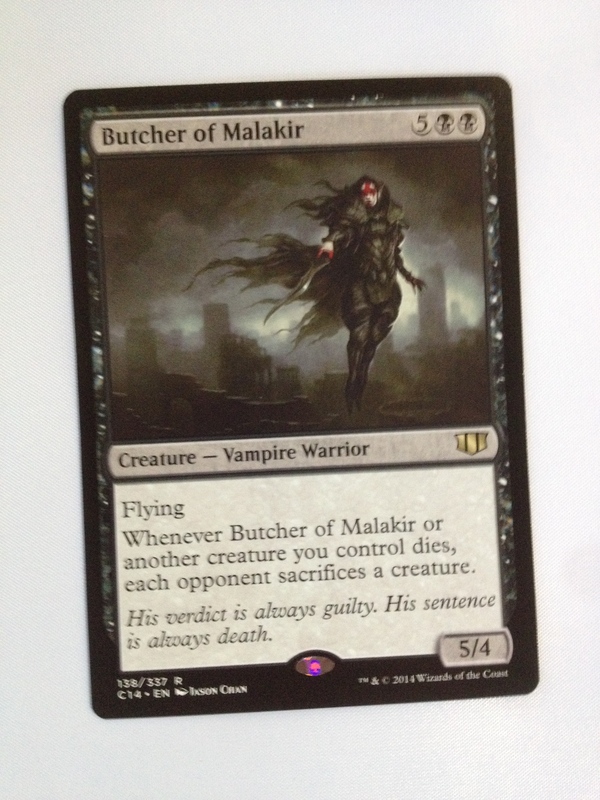 And if he kills a blocker or blockers, then he gets +1/+1 counters, which makes his stronger and even harder to kill when it isn’t your turn. Having to attack each turn is fine for a card like this. But he isn’t a blocker, unfortunately…He is generally tapped when you get to block. Arcanis the Omnipotent is clearly different. A good contrast. He is only a 3/4, but has built in evasion in that you can return him to your hand for two others and two blues…which you probably have out. Also, you can tap him in response to a sweeper or something if he isn’t already tapped, and then you get to draw three cards. Not what control players across the table want. So Arcanis is hard to kill in his own way. 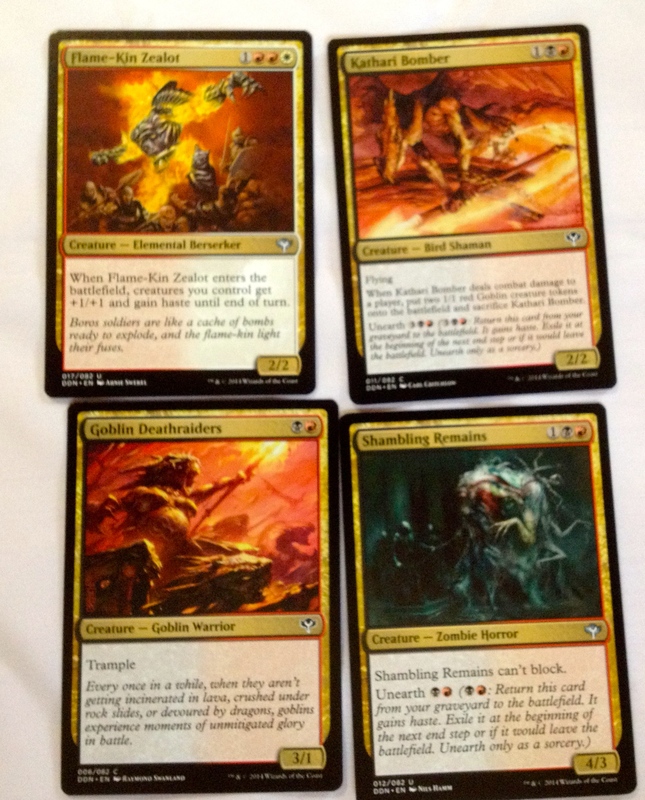 I will go over the components of Arcanis’ deck, “Cunning” first. 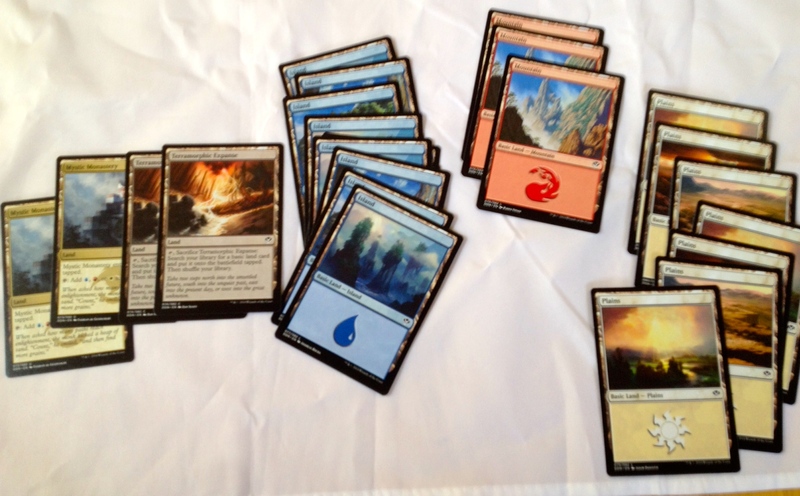 Notable here is Mystic Monastary, a “tri-land” that taps for all three colors. (you have to choose which you want each turn) That’s about it. 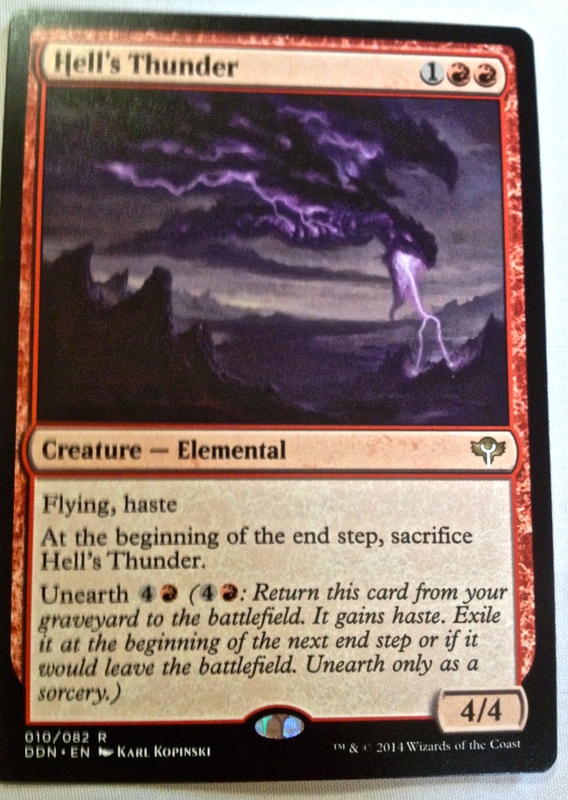 The two fetch lands are Terramorphic Expanse…also unremarkable. There is more blue land here than any of the other kinds. Here is a little survey of the cards. There is only one red creature. Lots of blue creatures. 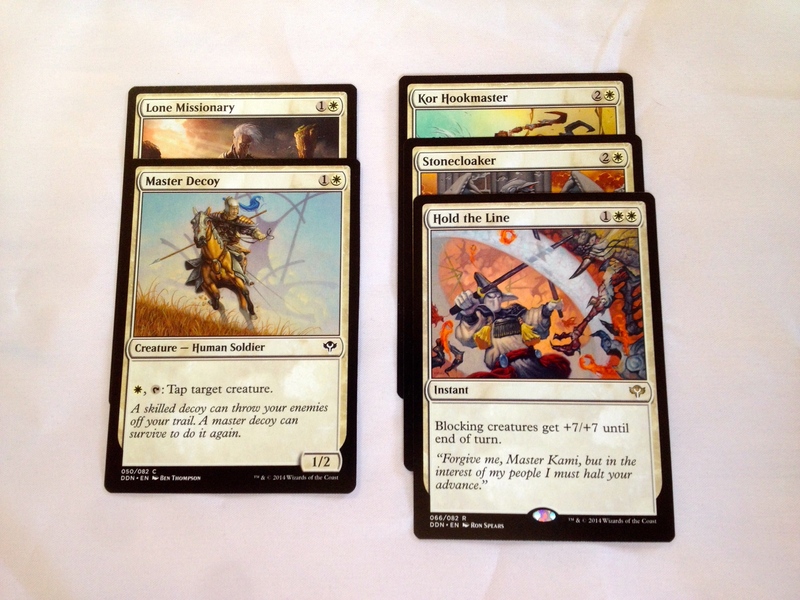 a bit of a mixture of white cards. And two gold cards. Hussar Patrol and Lightning Angel. 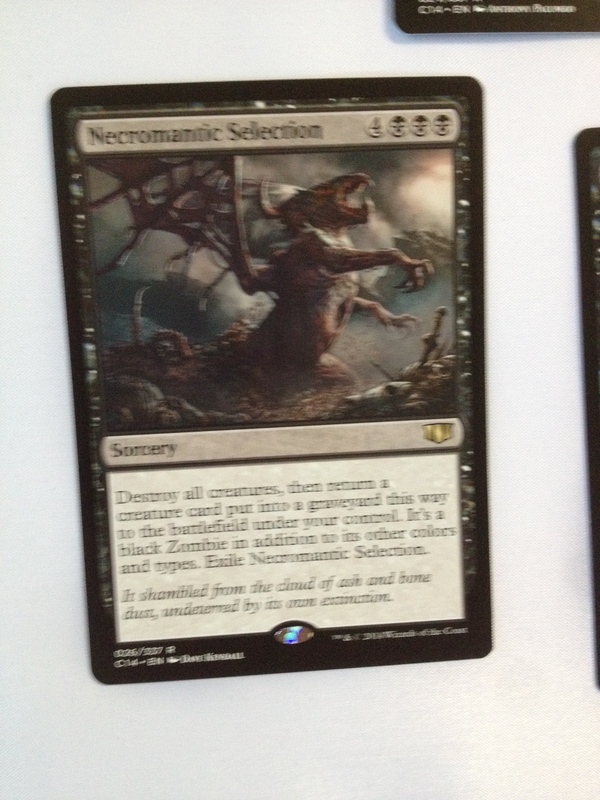 The only completely new cards here are Thousand Winds and Jeskai Elder. 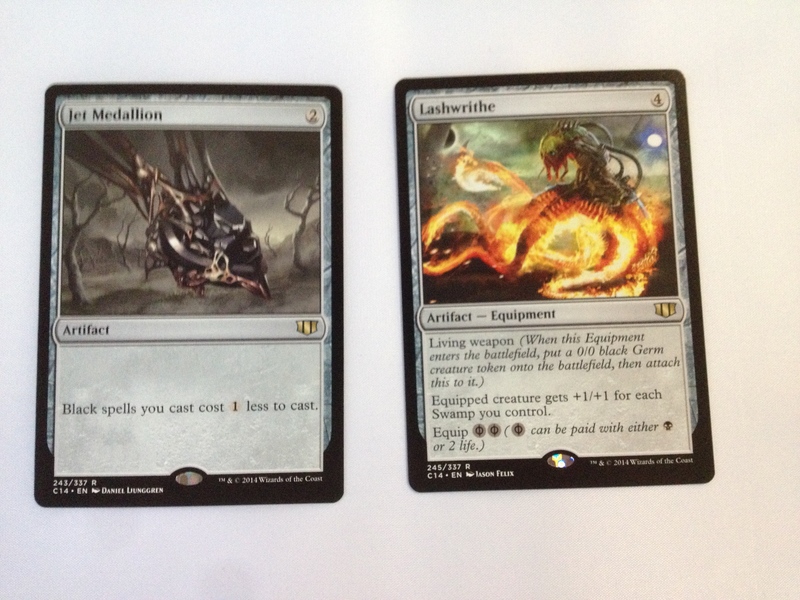 Thousand Winds is a creature with “Morph” a returning mechanic from the past. This time, when he morphs, all other creatures go to their owners hands. NICE! 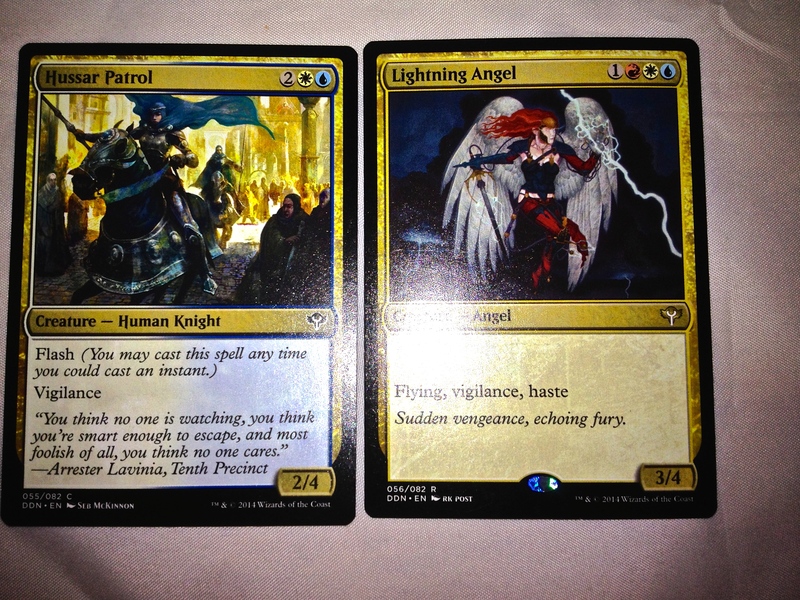 I thought Lighning Angel was pretty good. 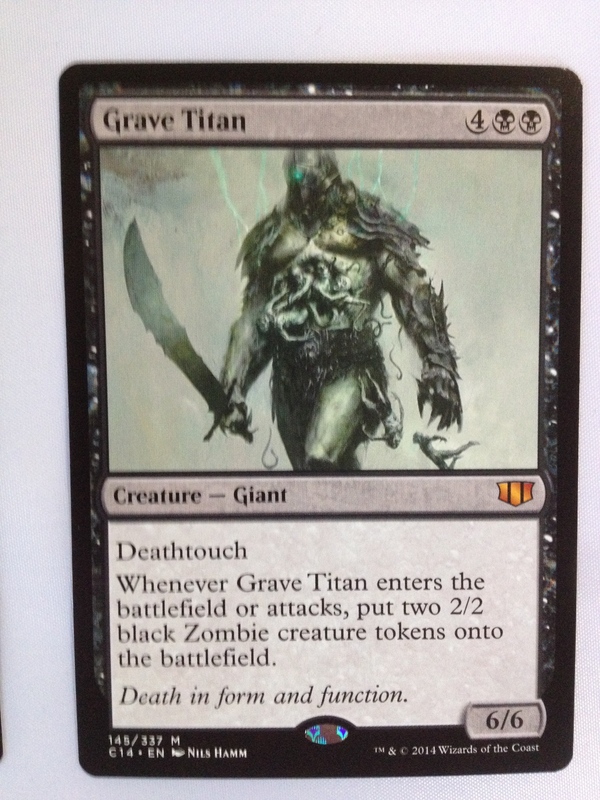 With a CMC of 4, flying, vigilance, and haste. 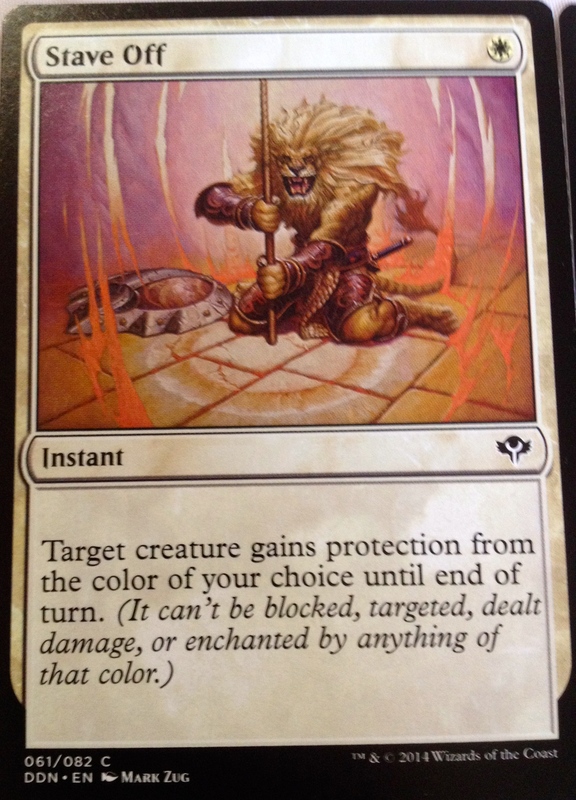 The Cunning Sparkmage is usually just a chump blocker. 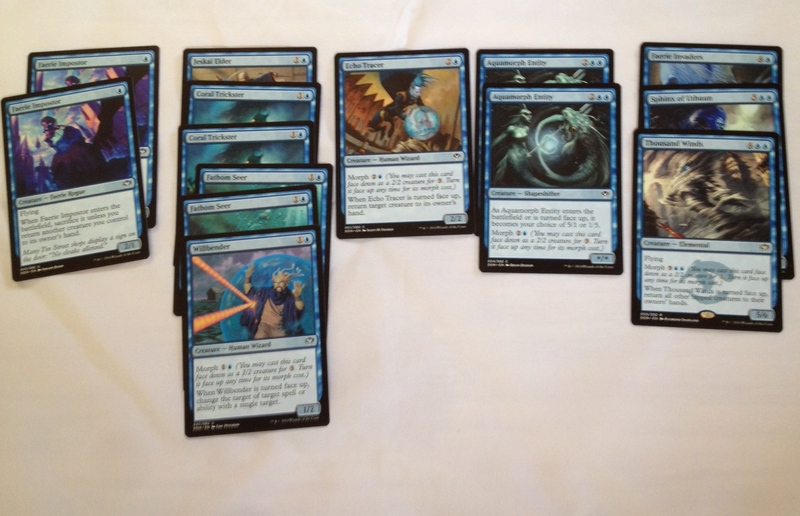 Many of the blue cards feature “morph.” This is where the beauty of this deck lies. 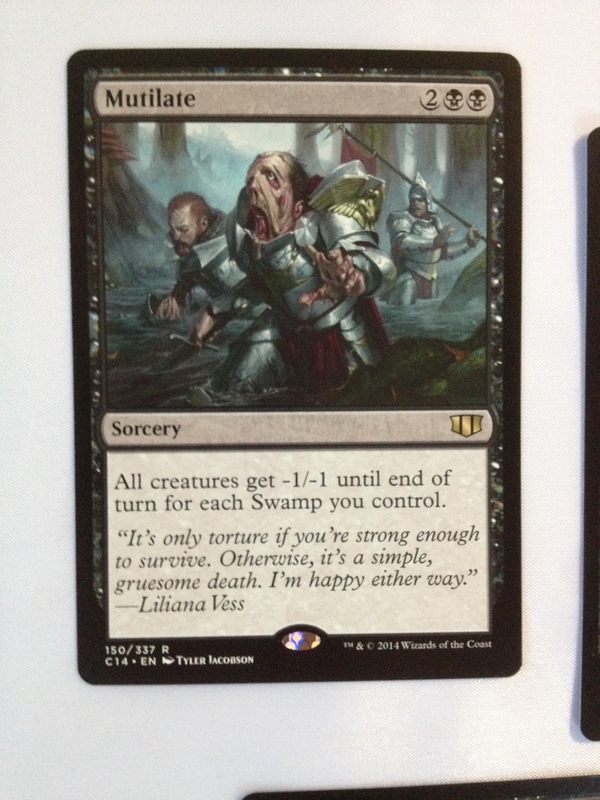 While it isn’t good to pay three for a 2/2 bland vanilla creature, morphing them is always a good thing to do. They all have some benefit for you that your opponent will not like. 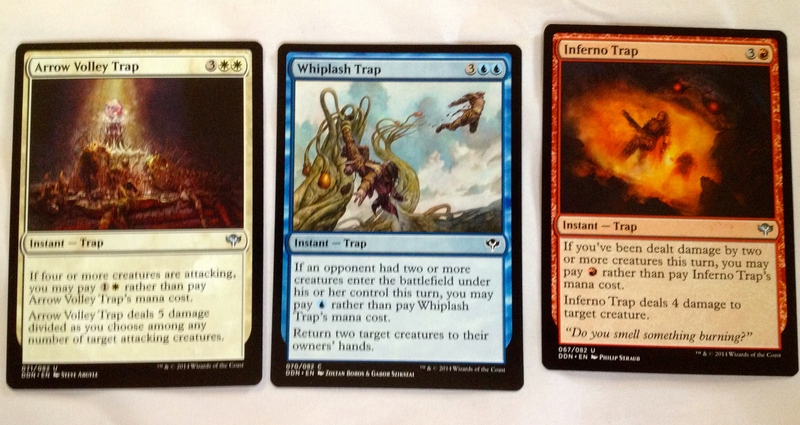 Here are the instants. These guys are all good. I would argue that “God’s Willing” is better than “Stave Off,” because you get to scry. 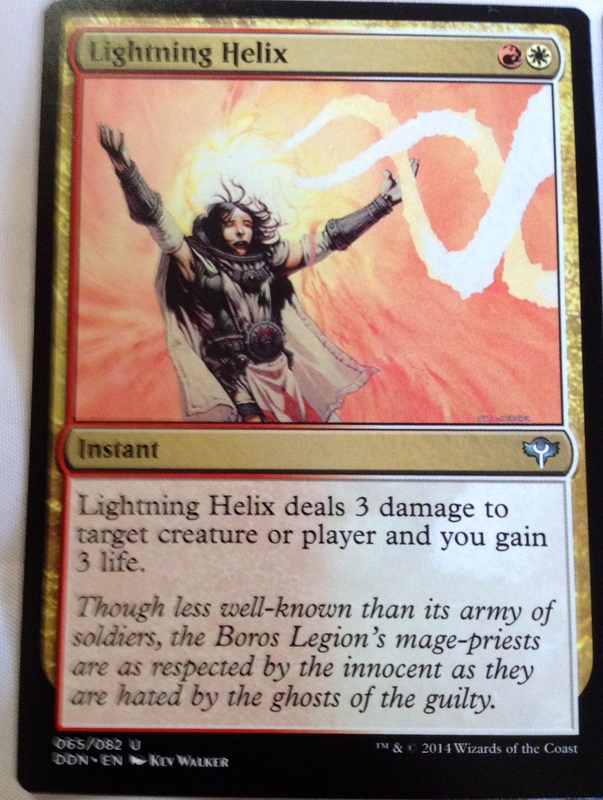 But scrying isn’t in this deck, so…Repeal and Lightning Helix are always cards people ask for to be reprinted…so here’s your chance, people! 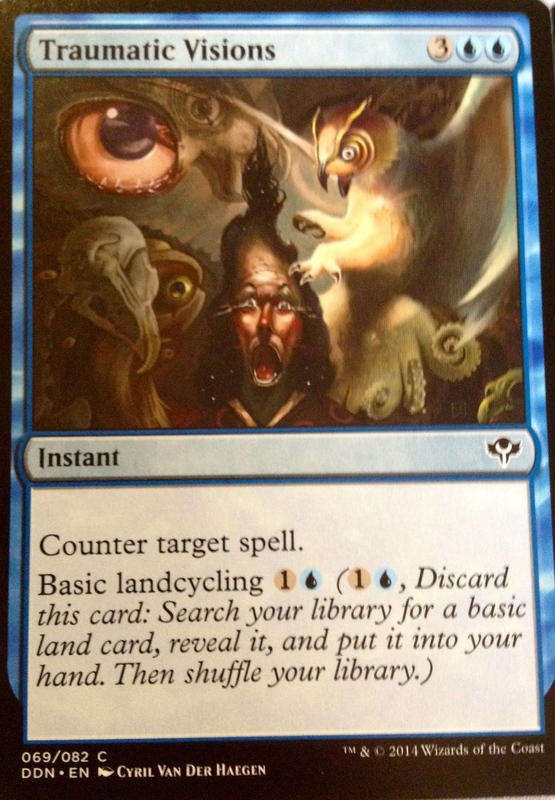 Steam Augury has seen some play lately…This card fits well with Impulse and Sphinx of Uthuun. Basically you are getting card advantage on your opponents terms somehow. 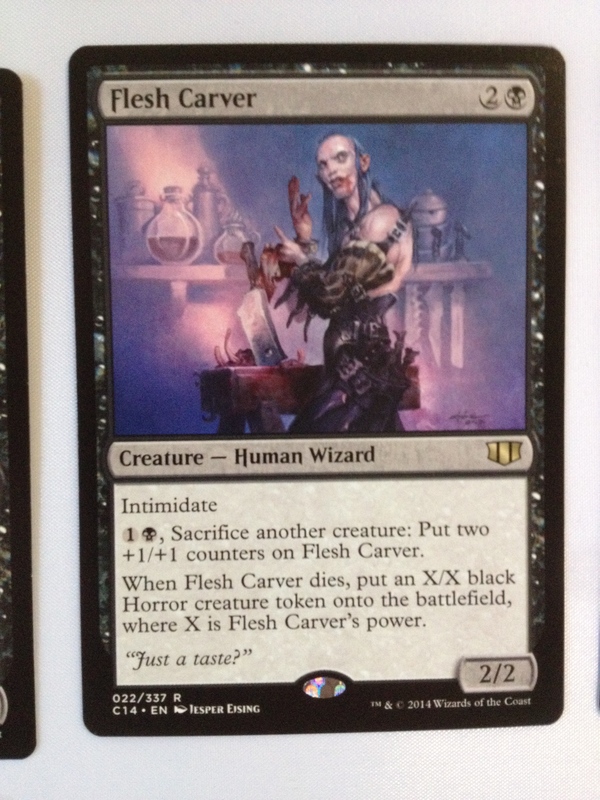 I didn’t know there were trap cards in Magic? 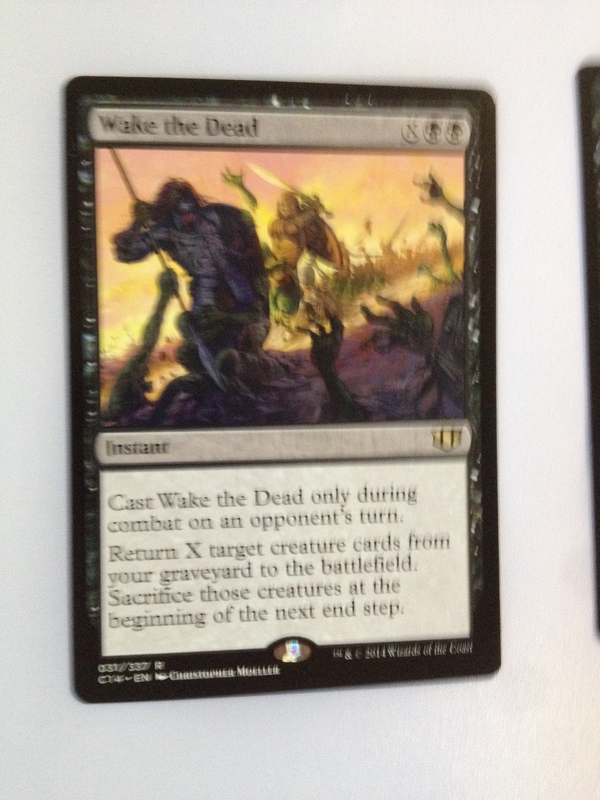 These are really bad for your opponent. 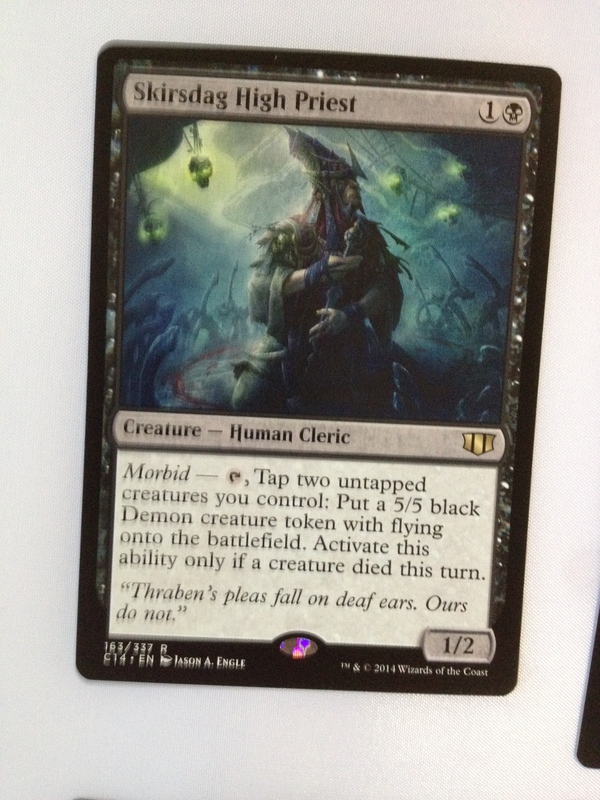 You get to play them for a cheaper mana cost under certain circumstances. 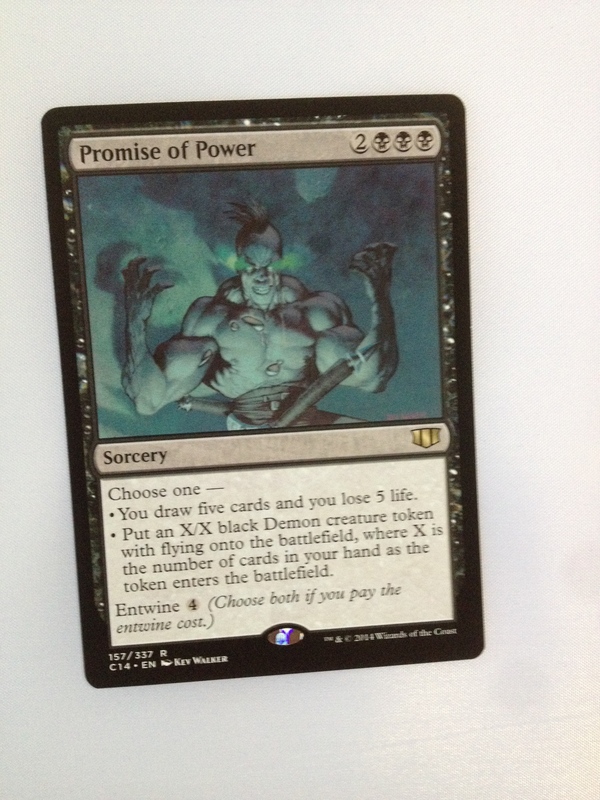 otherwise, it’s good for you, not for your opponent playing Zurgo. 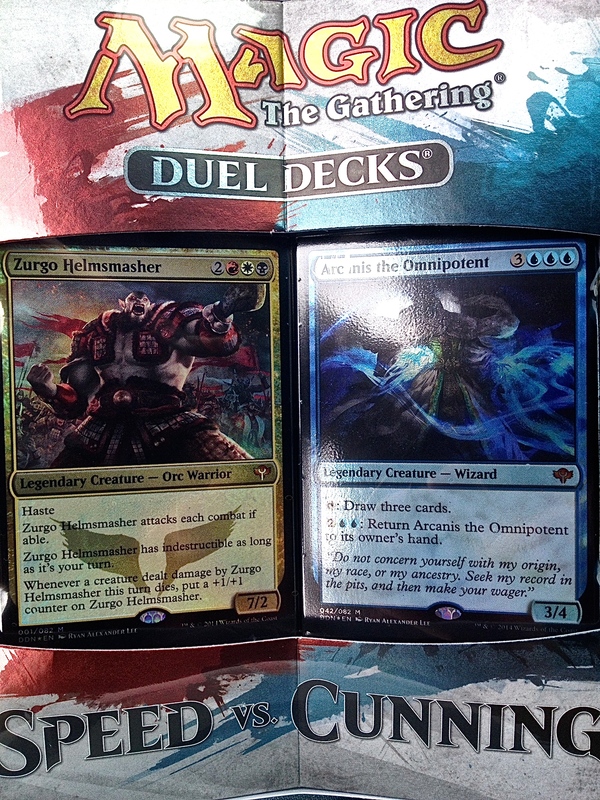 Speaking of Zurgo Helmsmasher, what does his deck contain? 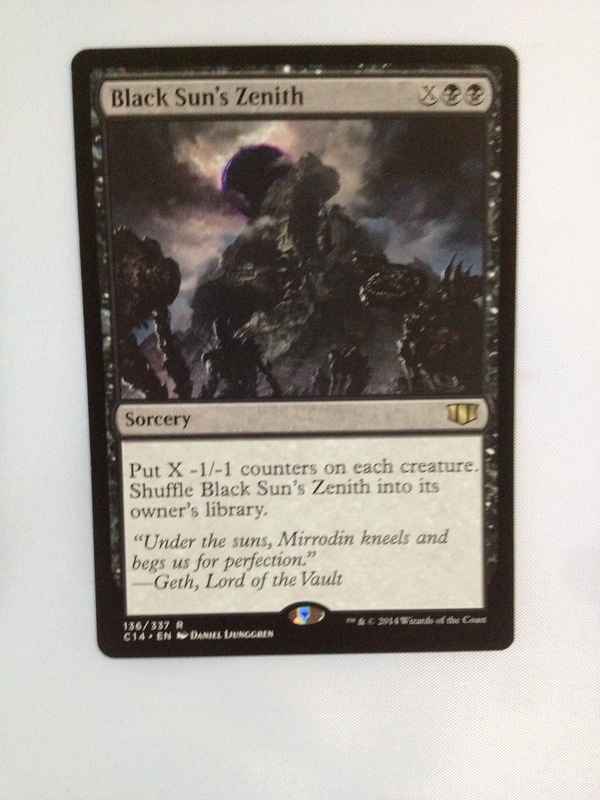 The “Speed” Deck has these lands. 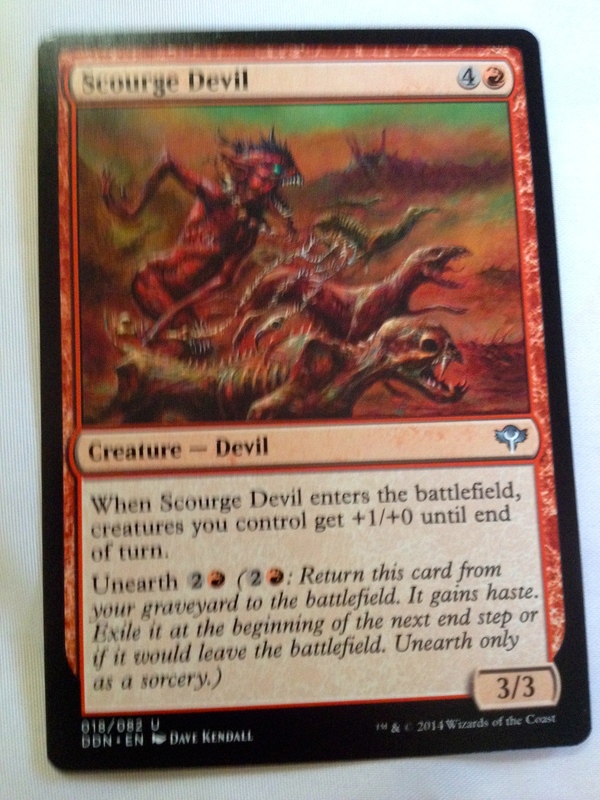 This deck is notable for its red creatures, its reliance on Goblins, and combat tricks…with a touch of burn. 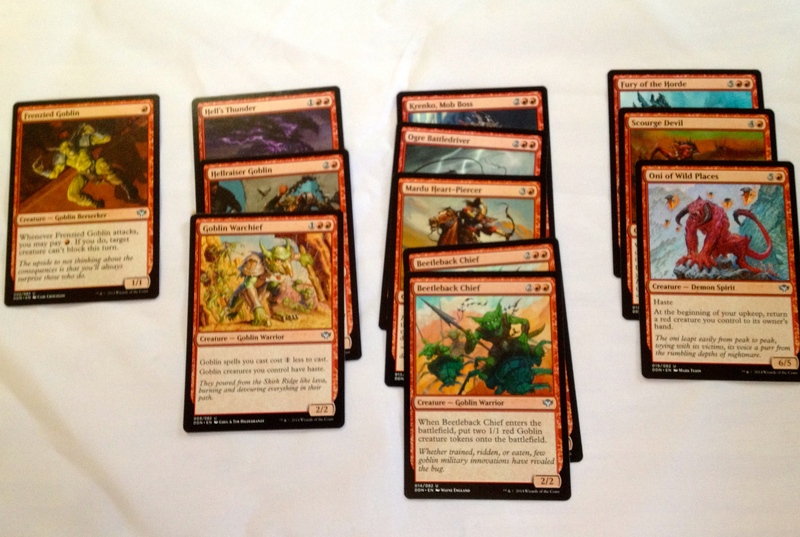 I would say that this deck is mainly red, and the other is mainly blue. Here are some notable examples. 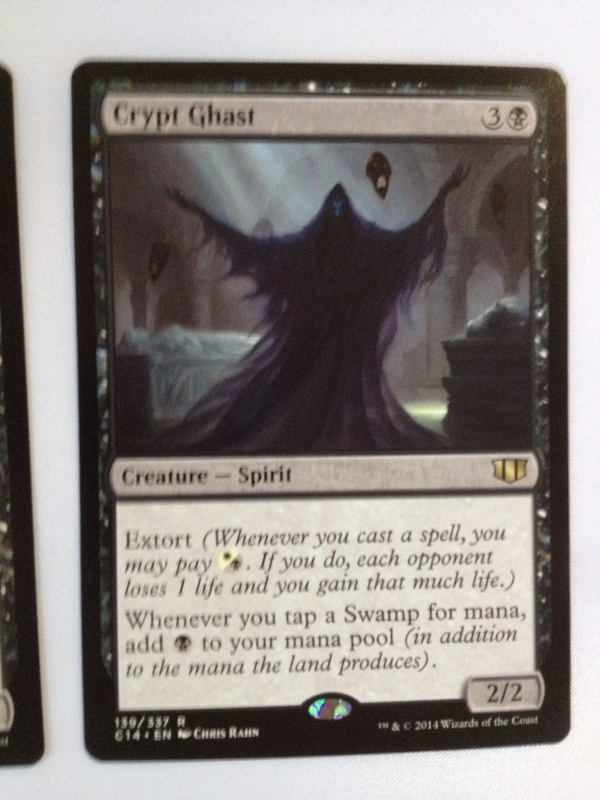 Notice the “Unearth” mechanic. You get kind of a “whip of erebos” trick with it. 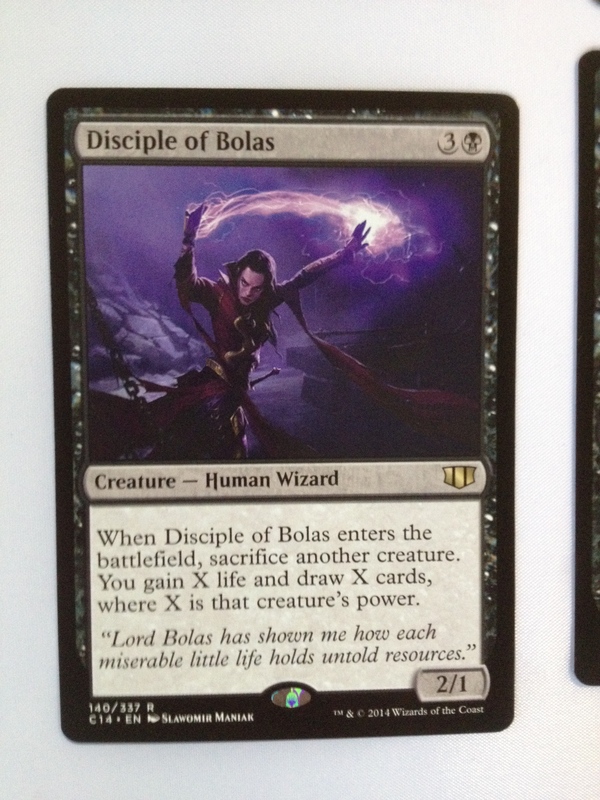 The wizards said that a quick play or effect and then exile is now going to be a regular thing. That last Chandra did this. 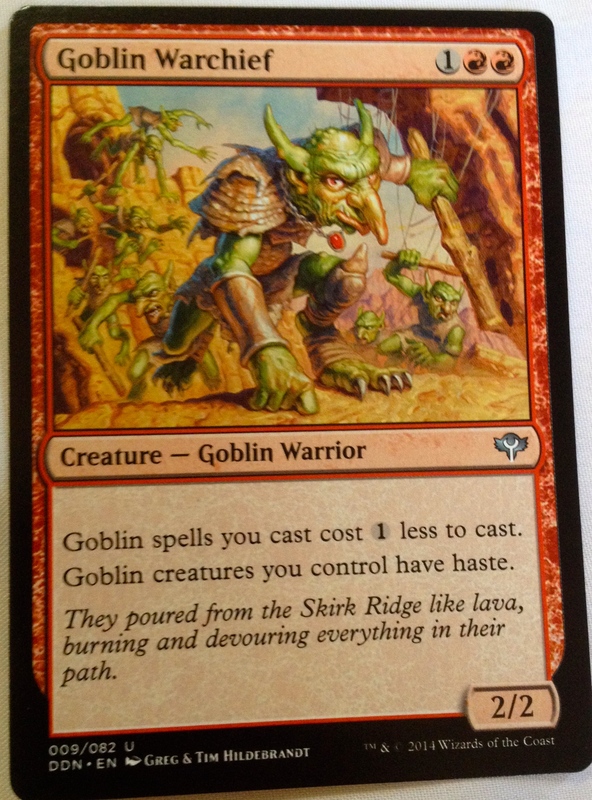 The Goblin Warchief goes well with the other goblins in this deck. And the spiritual opposite of Traumatic visions…Fiery Fall. 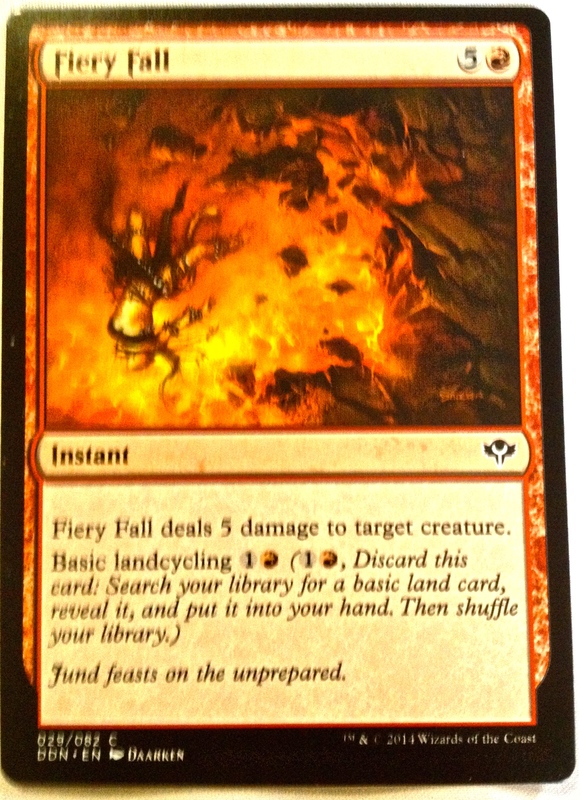 You can cycle for any basic land you need, or you get a Lava Axe with CMC 6. 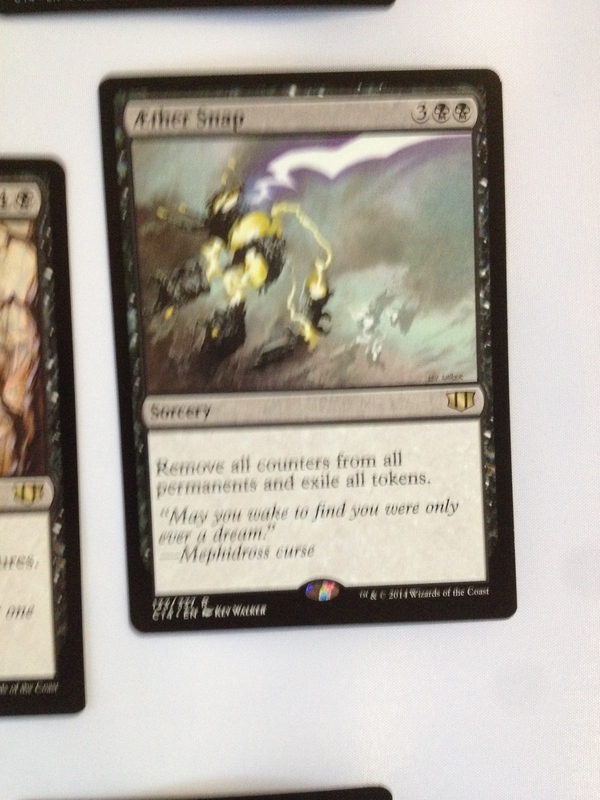 This says it all pretty much for Zurgo Helmsmasher’s deck. SO how did the decks play against each other? I have played against Arcanis several times. Clearly that is the better deck. Zurgo’s deck is supposed to be about speed, but the mana curve isn’t quite right or something. Zurgo himself is impressive, but everything else just isn’t good enough against all of the ability for Arcanis to respond. 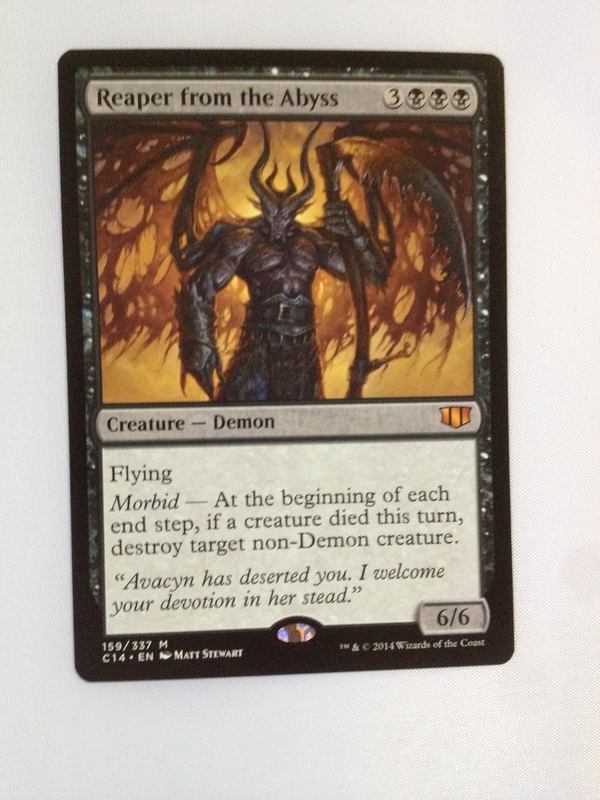 Arcanis has the traps, the instants, and the morphs going for him, as well as card draw. Zurgo is supposed to be a beatdown deck, but unless you draw the right goblins early and curve into the big stuff just right, you won’t have a chance against Arcanis. 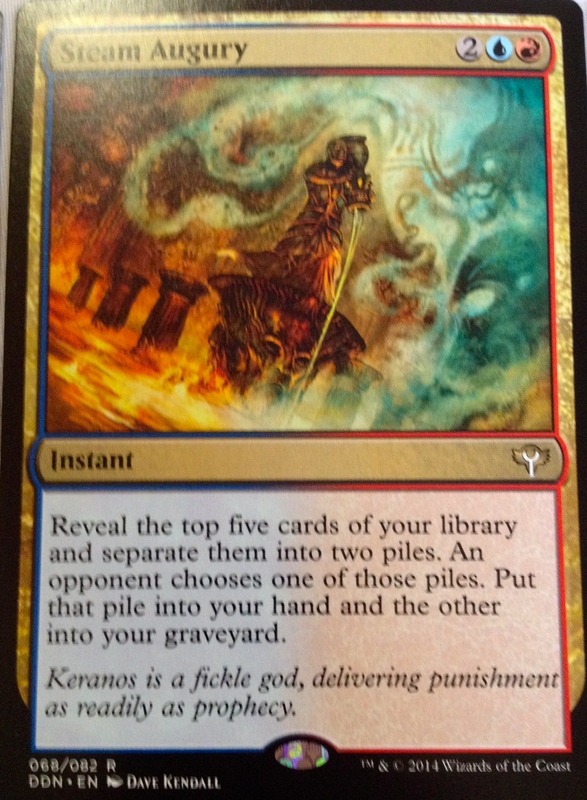 I also played the “Paulkranos World Eater” deck from the same time last year that introduced “Theros” This Hydra did better against Arcanis. But Arcanis still had plenty of answers. My rating for this product? 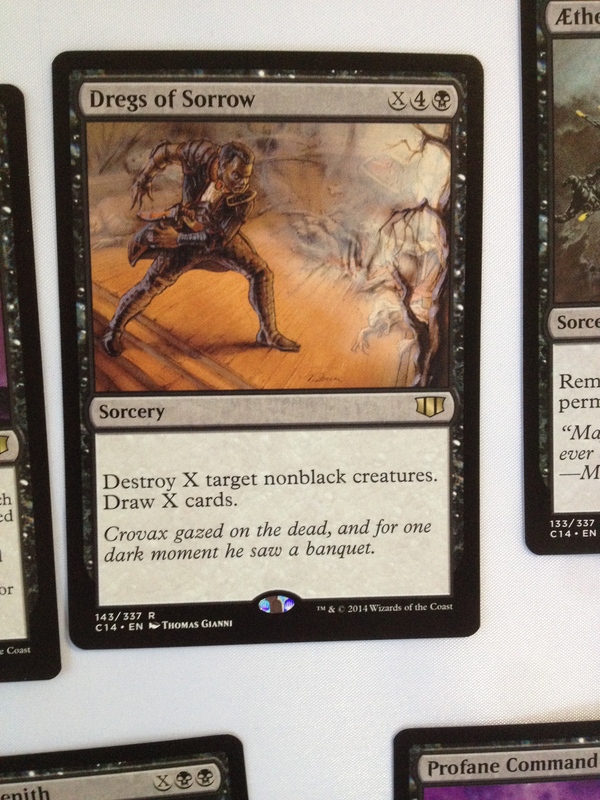 But Zurgo’s deck falls flat. I am going to give it a 2/5. If it curves out wrong, you don’t stand a chance against it’s opposite. 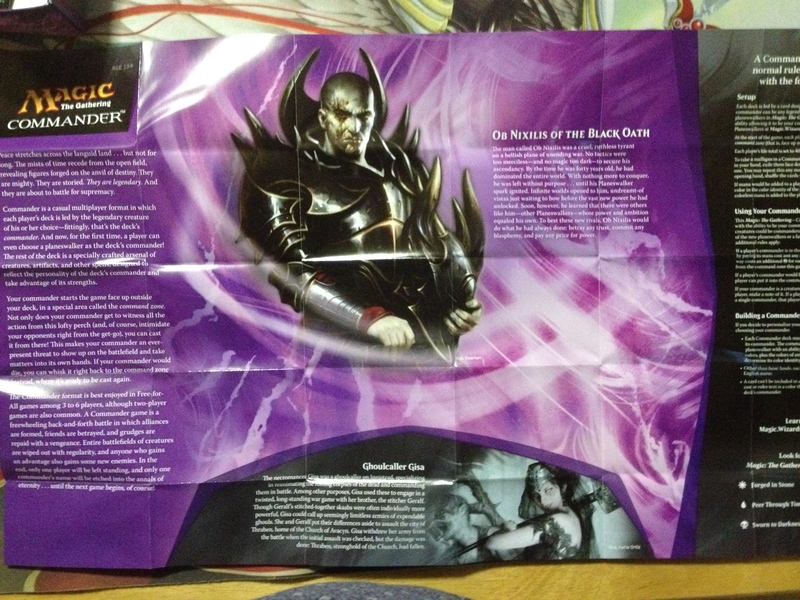 The packaging was less spectacular than the last similar product, but on the other hand they improved the introductory propaganda for new players. I always just ditch the packaging anyways. 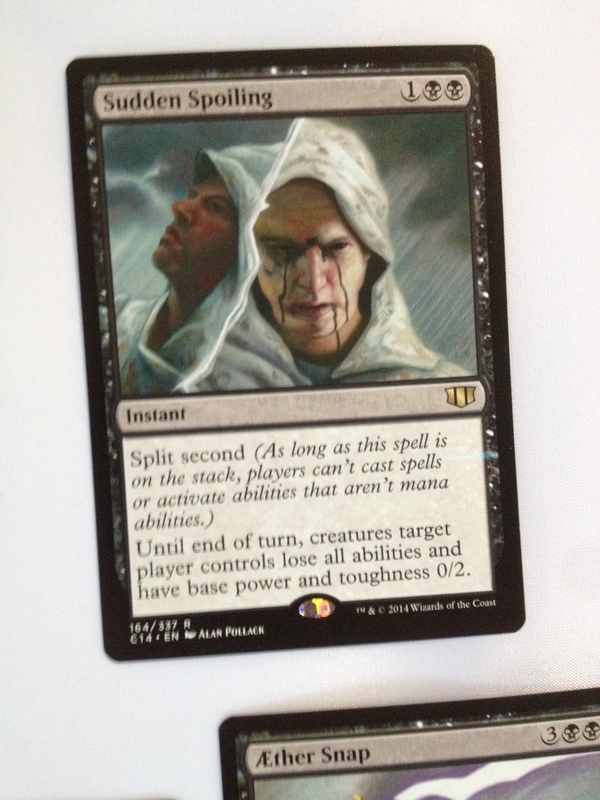 So Magic the Gathering Duel Decks “Speed vs. Cunning” gets a 3/5 from the SpartanNerd. What do you think? Let me know in the comments!